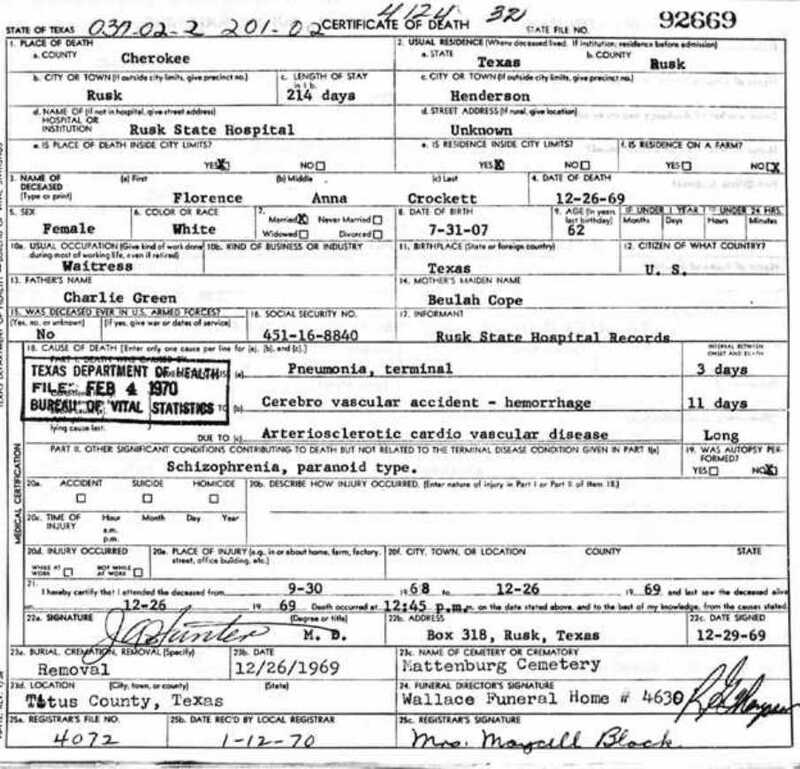 Directions from Gilmer----take Hwy 271N to Bettie, turn left on FM2088, take FM2088 to FM2454, turn right, go to FM556, and turn left. 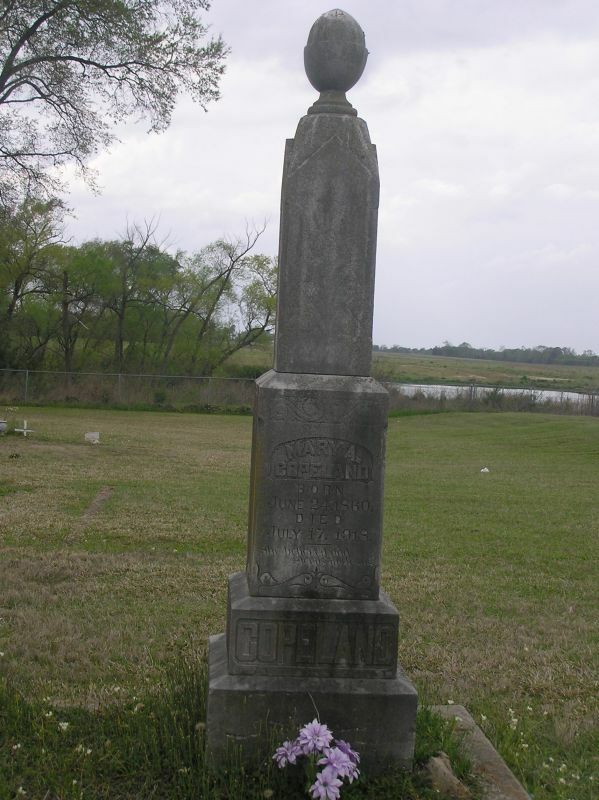 The cemetery is located behind the Mattinburg church. 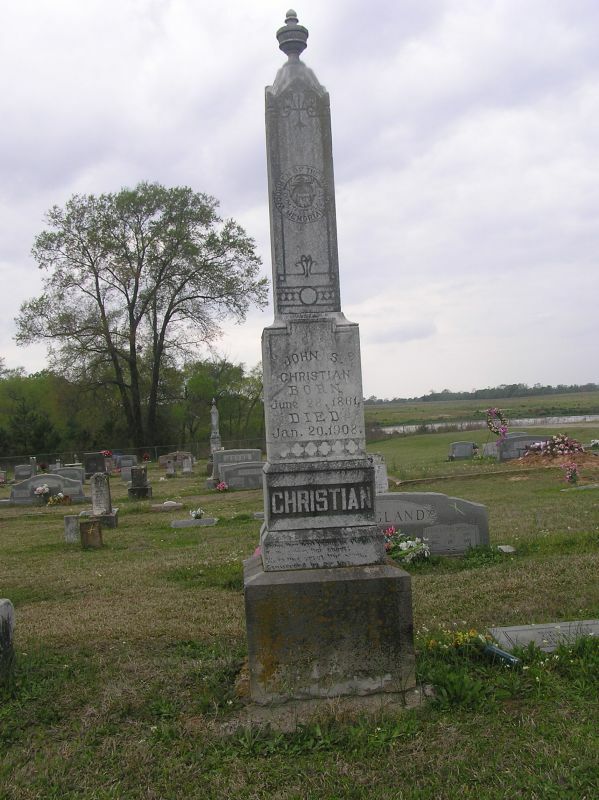 Updated: March, 2009 complete with photos by Geraldine Little Braswell & Sandy Span. 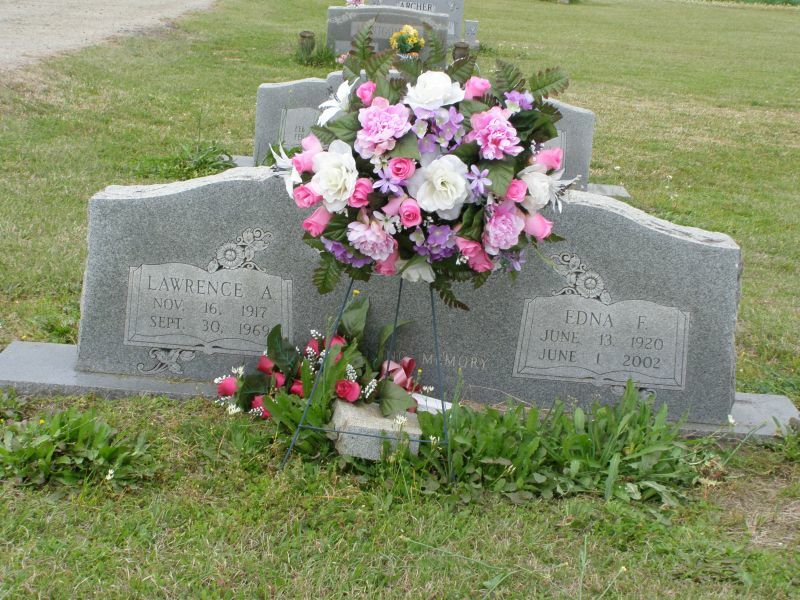 Read on Mat 24, 1998 by John and Nelda Strube and submitted by the Upshur County Historical Commission. 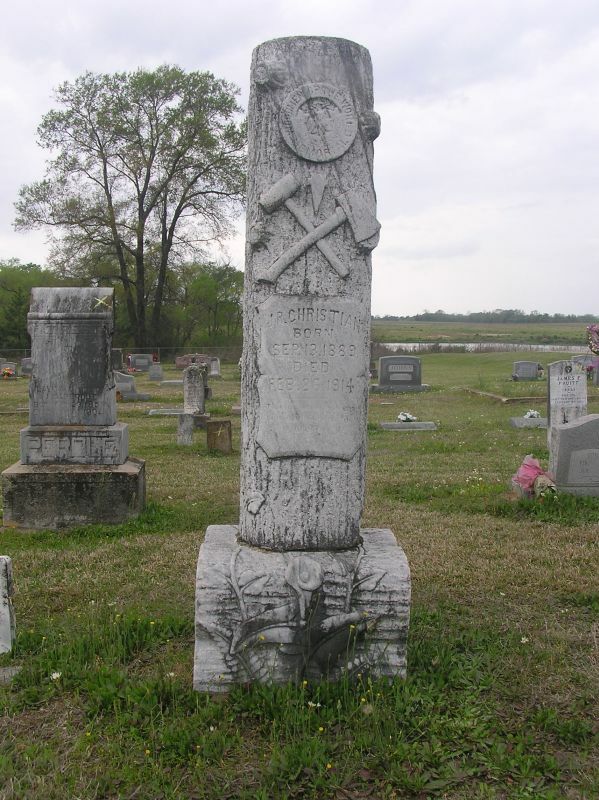 Thanks to Carmon C. McManigell for the use of her Puckett pictures. 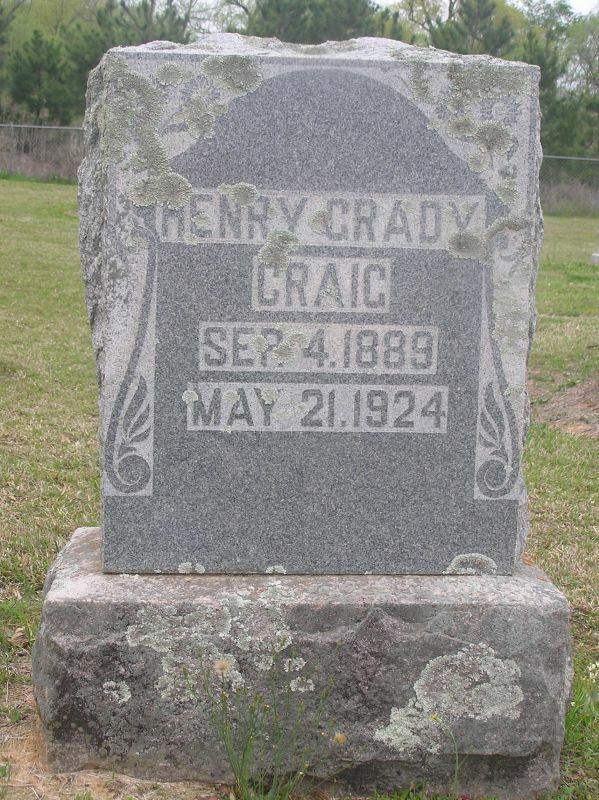 Thanks to Nancy Adams for sending in her pictures. 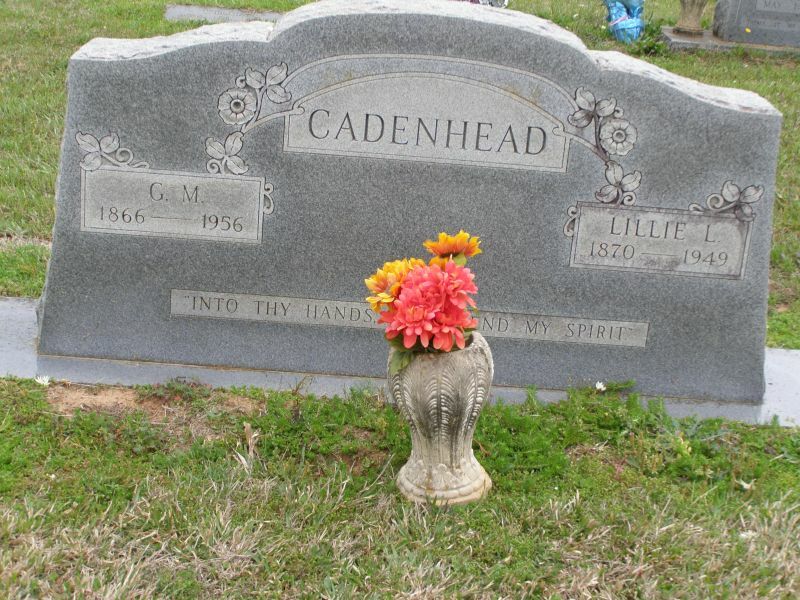 Cadenhead, Frances Caroline "Carrie" Jan 11, 1836 Sep 5, 1908 Per Ronald Wade - Frances Caroline "Carrie" Harrison Cadenhead, born in Georgia her mother was named Mary Harrison born 1810 Ga. On 11 Nov 1851 in Ga. she married James Martin Cadenhead (1829-1913) and their children included John W. Cadenhead (1852 – 1942), James Lunus Cadenhead born about 1854, Alexander B. Cadenhead born about 1854, Frances Elnora Cadenhead born about 1858, Martin S. Cadenhead (1866 – 1956), Sallie Cadenhead born about 1870, Frank Cadenhead born about 1872. 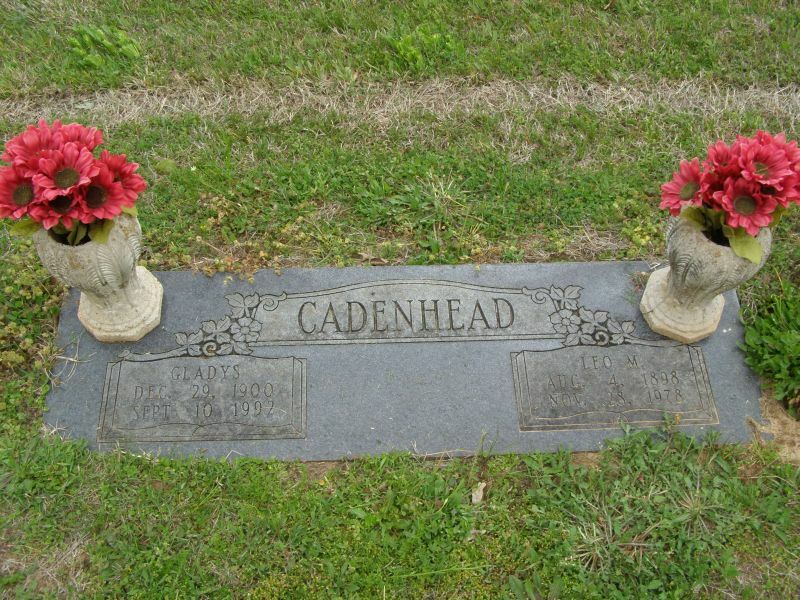 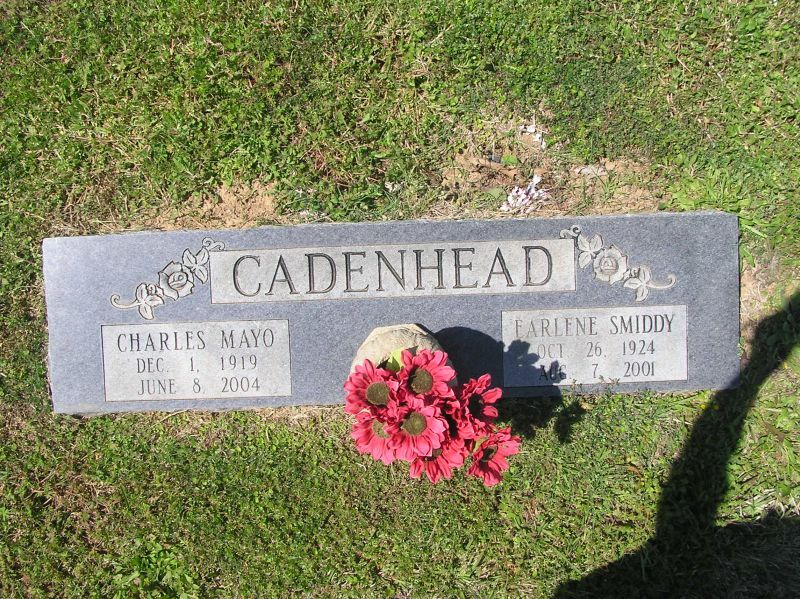 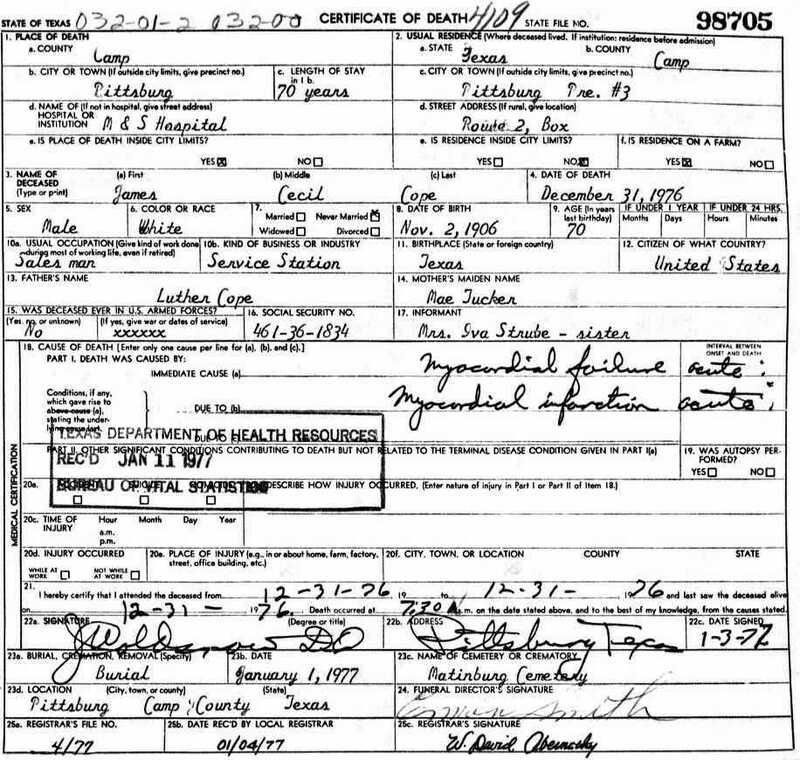 Cadenhead, J M Jun 17, 1829 Dec 27, 1913 Per Ronald Wade - James Martin Cadenhead, born in Upson Co., Ga., the son of John W Cadenhead (1805 – 1850) and Mary Womack (1810 – 1895). 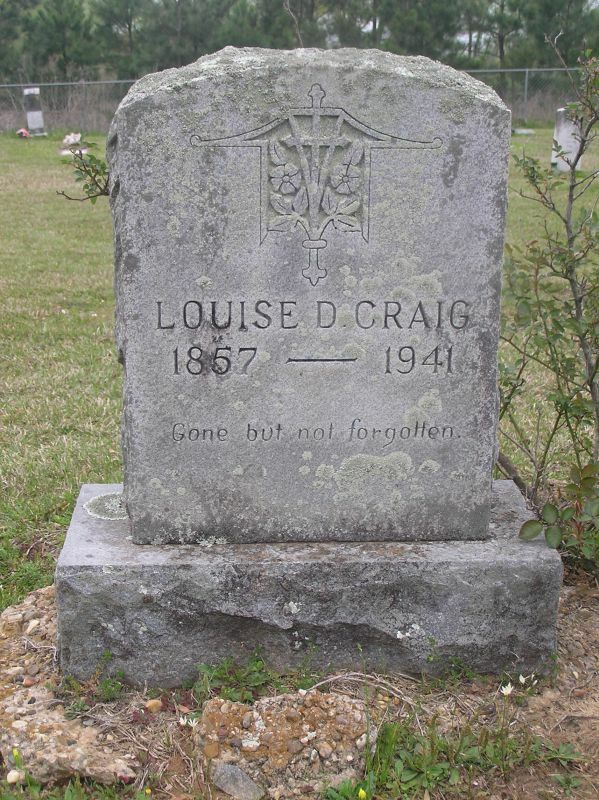 On 11 Nov 1851 in Ga. he married Frances Caroline Harrison (1836 – 1908). 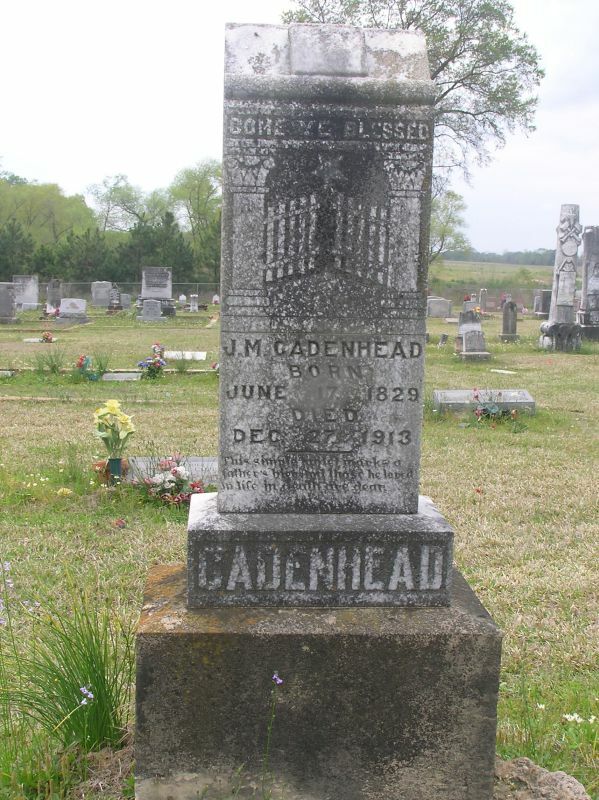 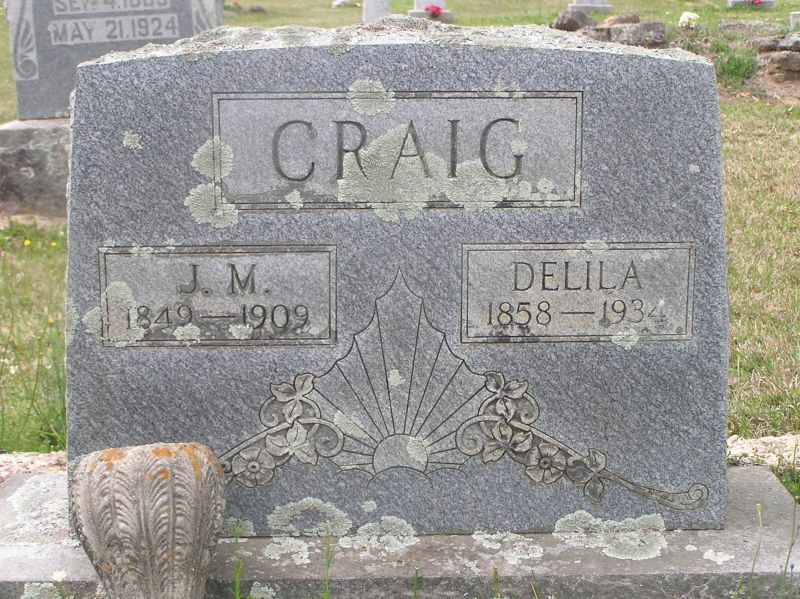 Their children included John W. Cadenhead (1852 – 1942), James Lunus Cadenhead born about 1854, Alexander B. Cadenhead born about 1854, Frances Elnora Cadenhead born about 1858, Martin S. Cadenhead (1866 – 1956), Sallie Cadenhead born about 1870, Frank Cadenhead born about 1872. 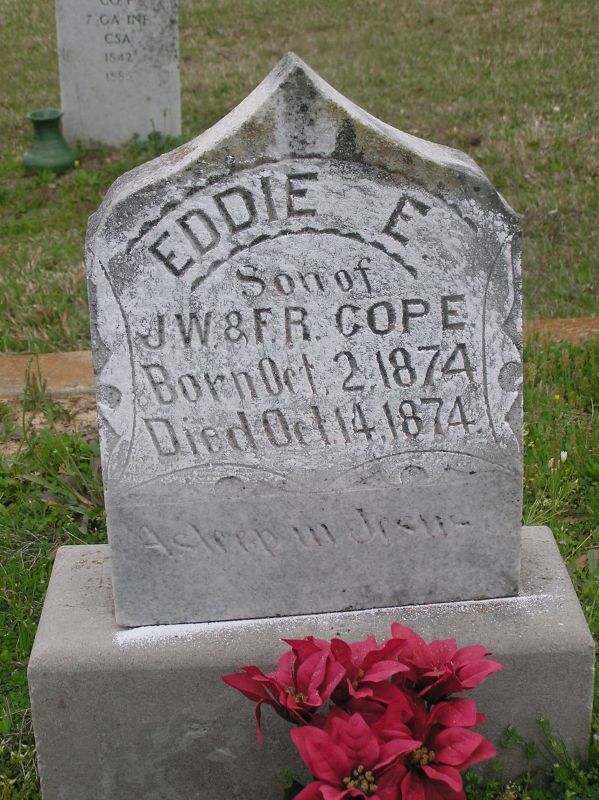 During the Civil War he was a 1st Lieutenant, 40th Regiment, Mississippi Infantry. 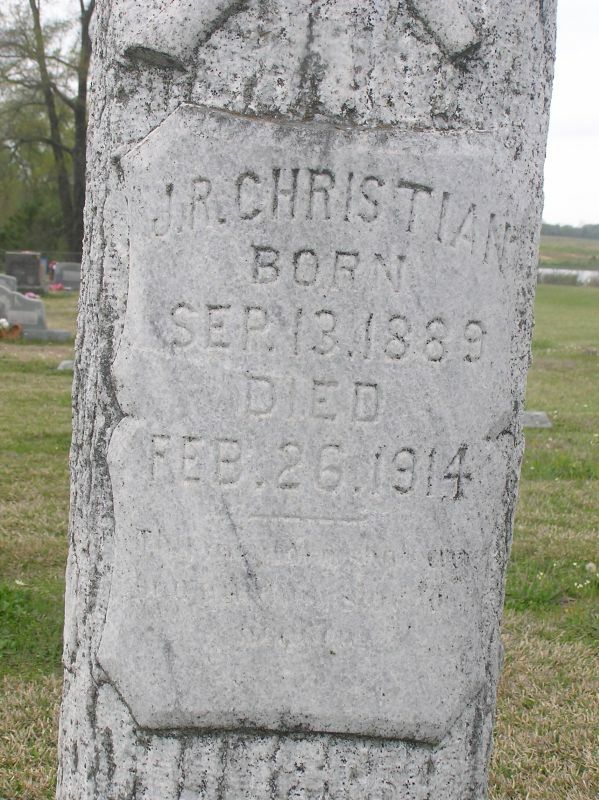 He surrendered with the Confederate Army of Gen. Joseph E. Johnston on April 26, 1865 between Greensboro and Raleigh, North Carolina. 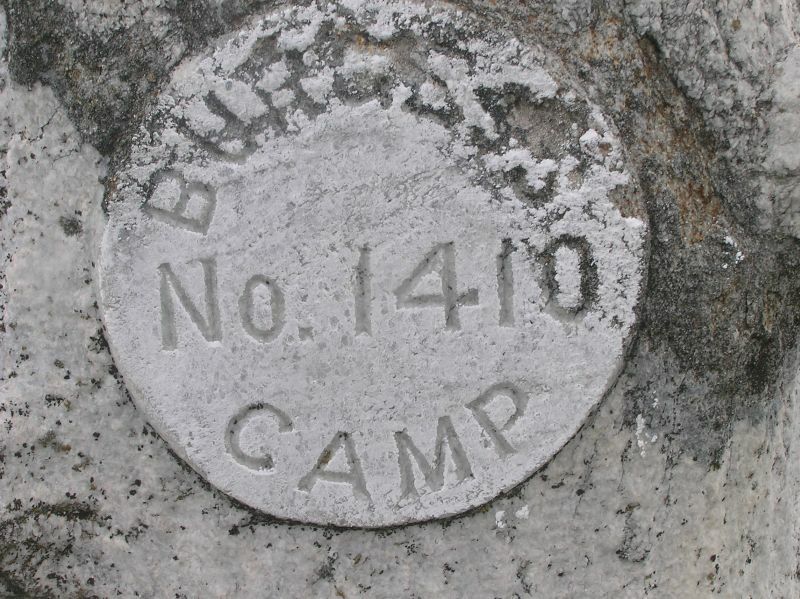 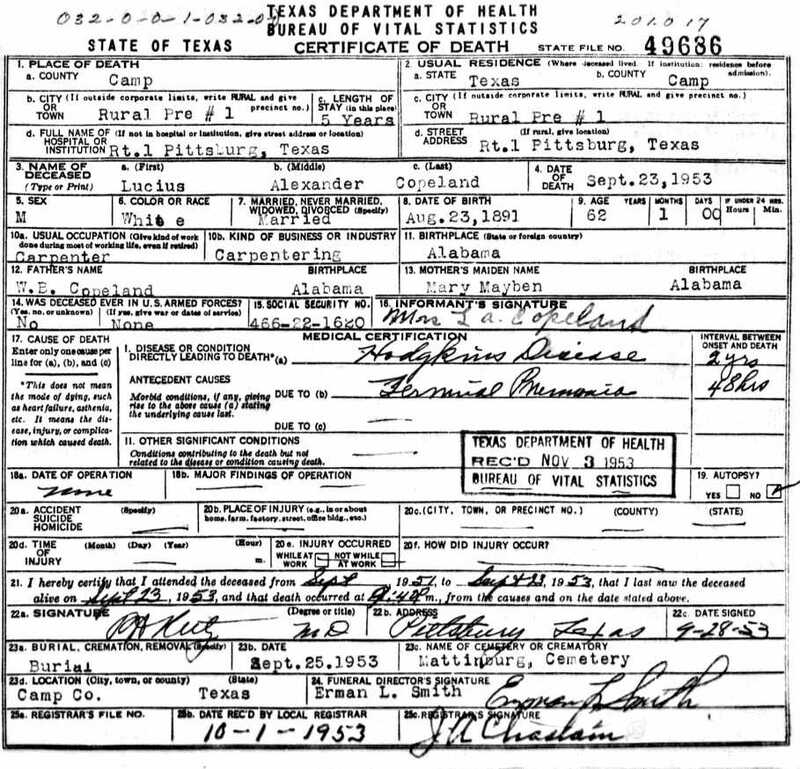 He applied for a Confederate Pension from Camp County, Texas. 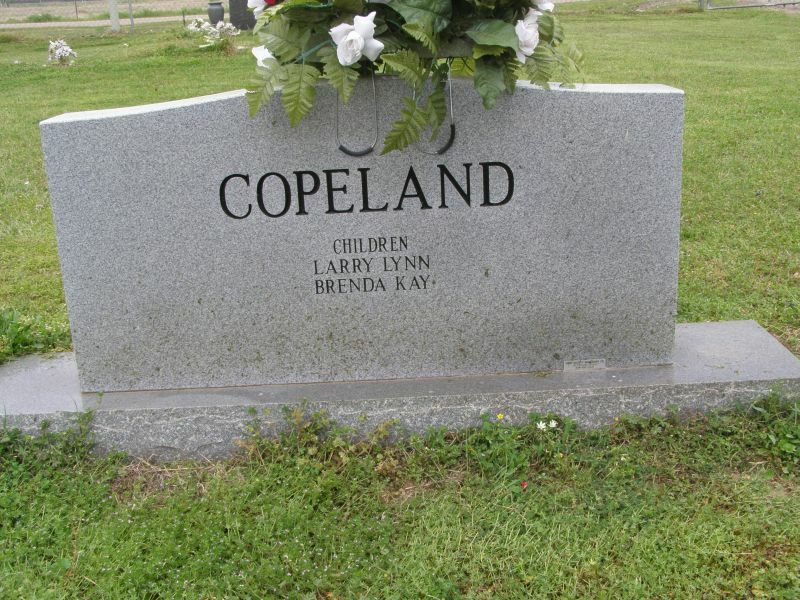 Copeland, Bernice Oct 4, 1899 Dec 28, 1952 Per Ronald Wade - Bernice Goolsby Copeland, born in Texas the daughter of Luther Musie Goolsby (1879 – 1954) & Ava Ethel Tucker (1879 – 1943). 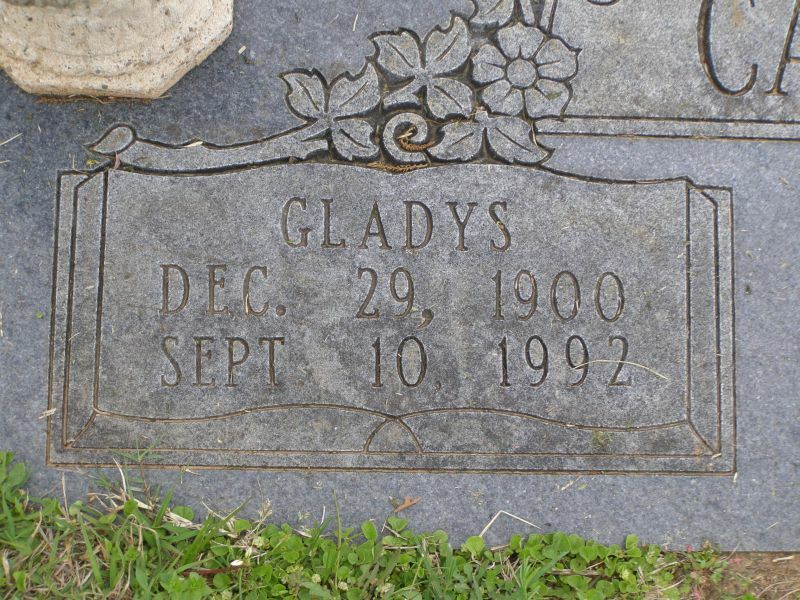 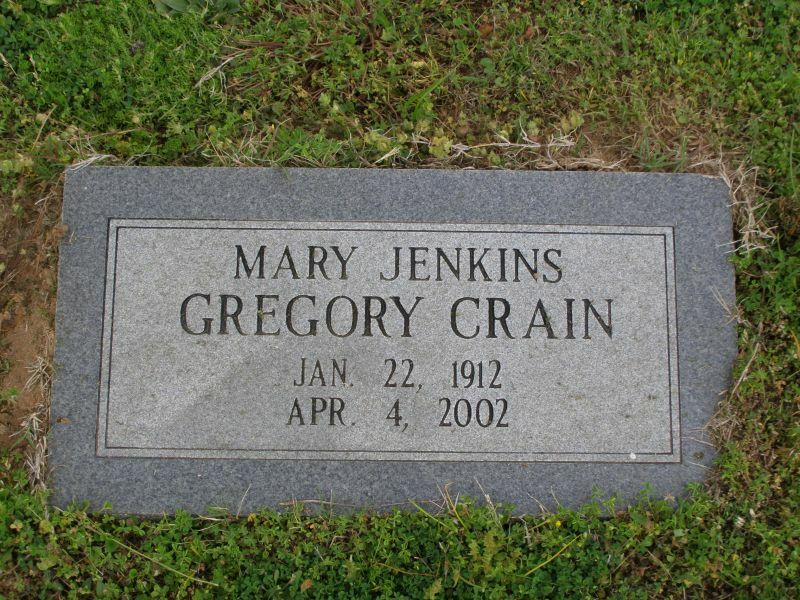 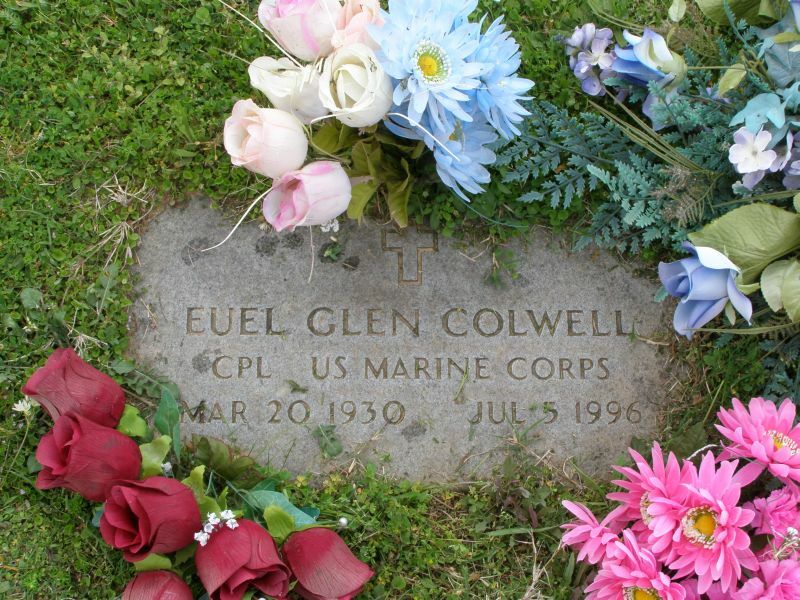 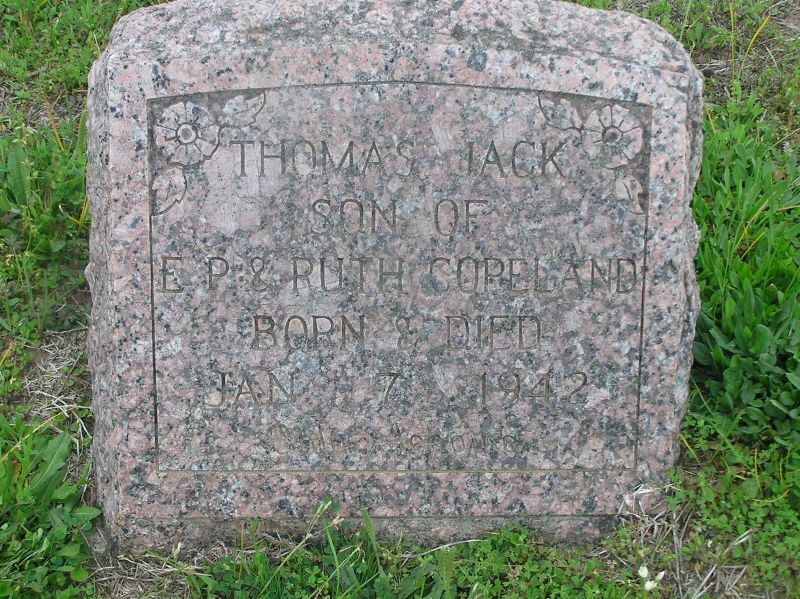 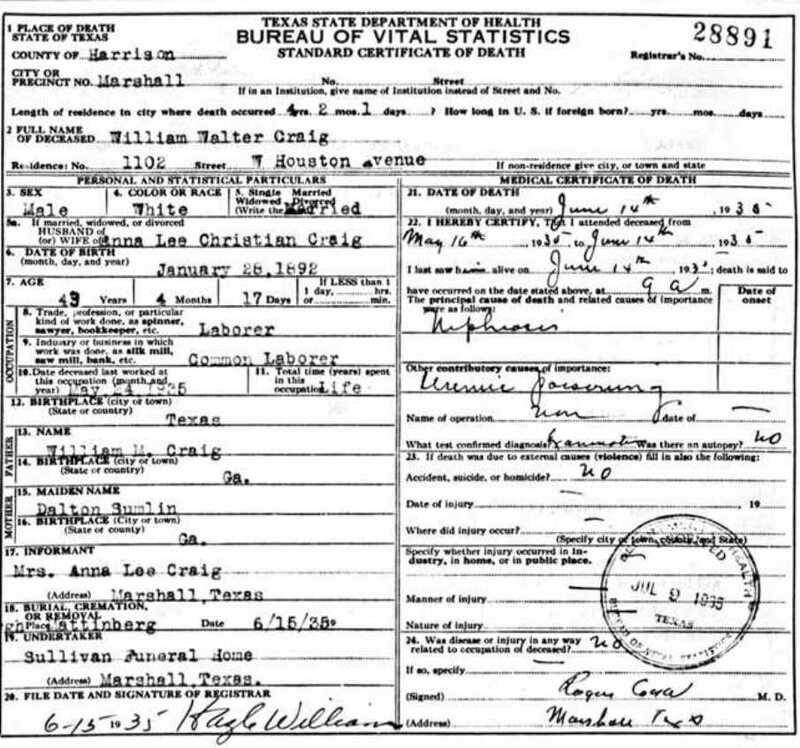 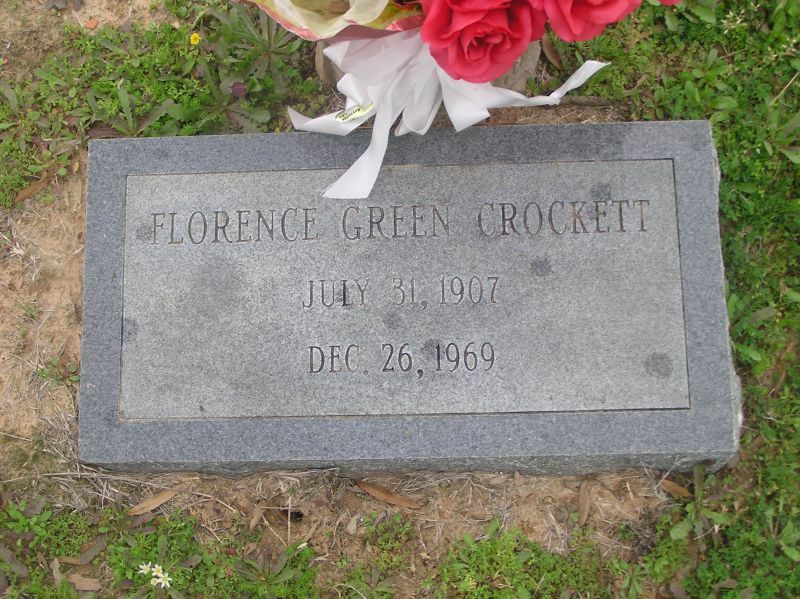 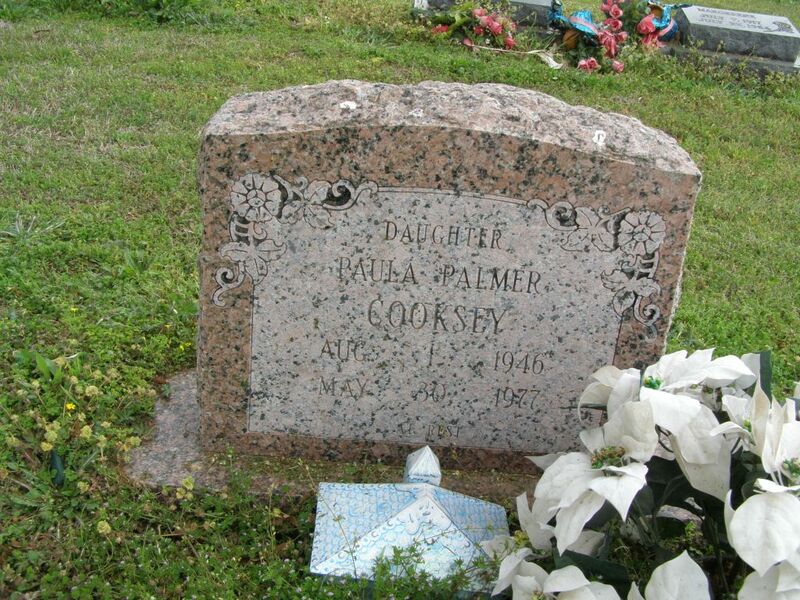 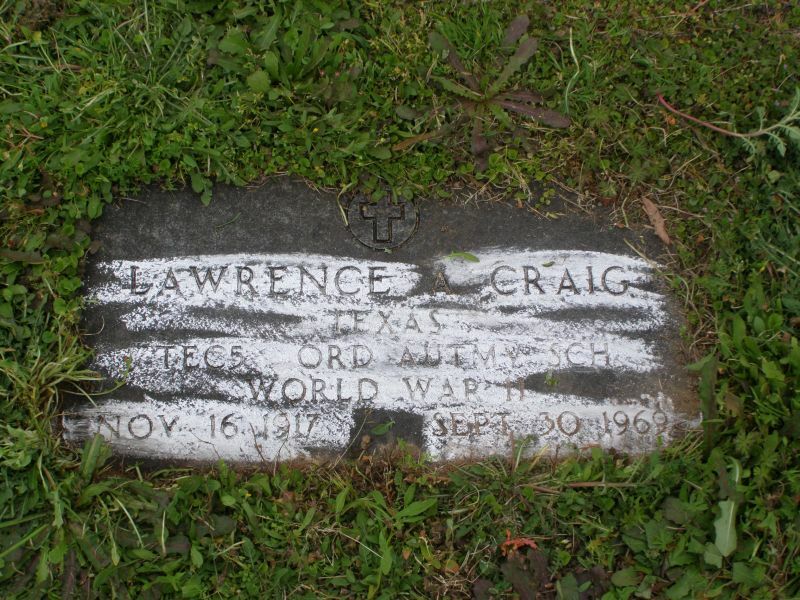 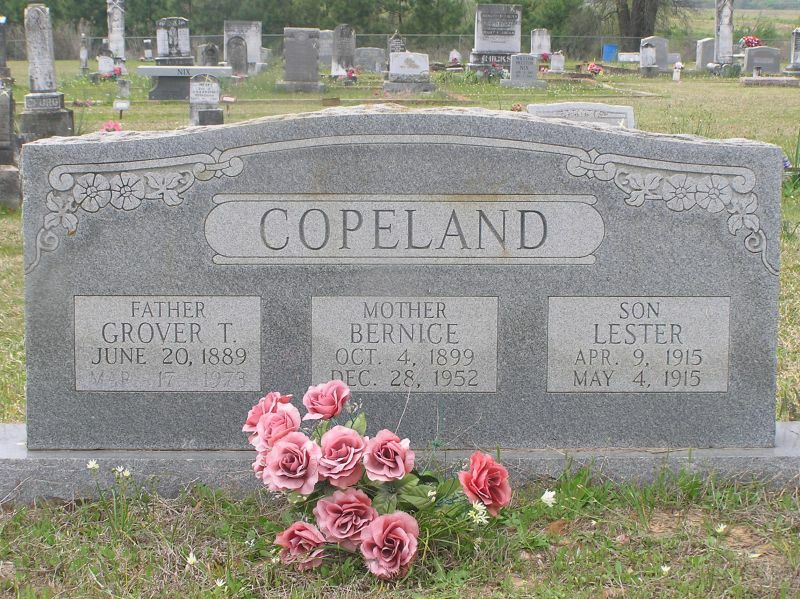 She married Grover Tamlian Copeland (1889-1973) and their children included Thelma Copeland born about 1914, Lester Copeland (1915-1915), Aaron M. Copeland (17 Aug 1916 - 1 Dec 1987 buried Restland Memorial Cemetery, Dallas, Tx. 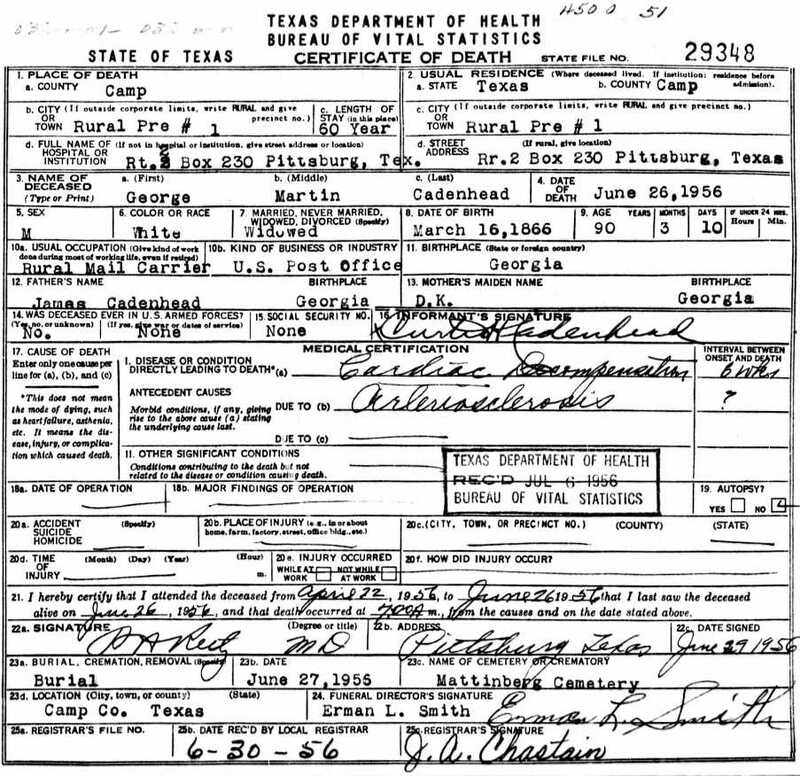 ), Grover T. Copeland, Jr. (30 Jan 1923 - 22 Feb 1997, buried Perryville Cemetery, Wood Co., Tx. 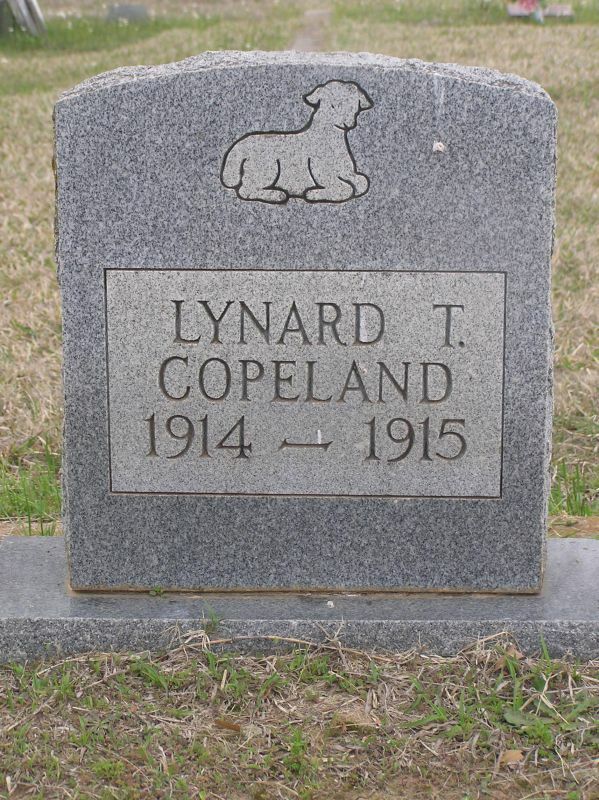 ), Owis K. Copeland (19 Sep 1924 - 4 Nov 2000 Rockwall Co., Tx.) 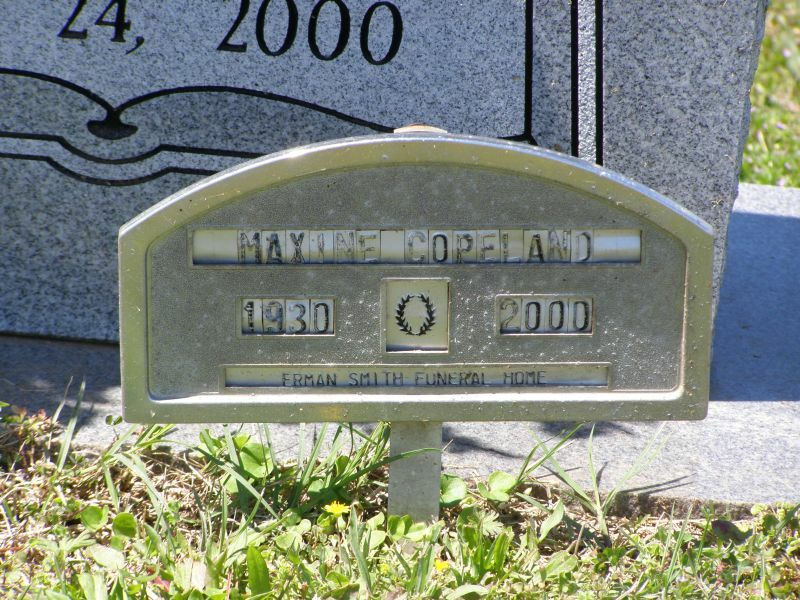 and Mary Avie Copeland (born 29 Feb 1928). 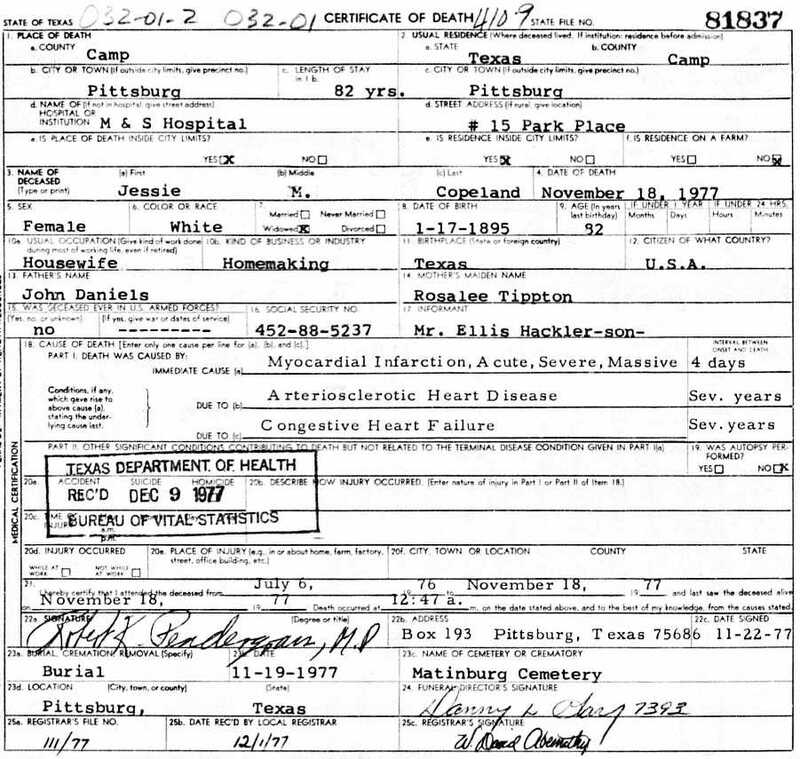 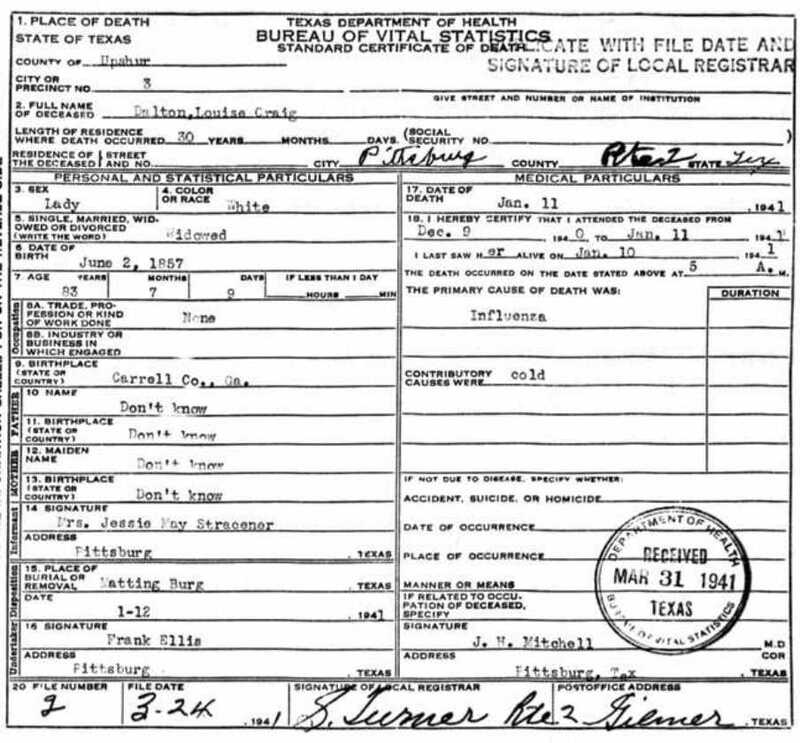 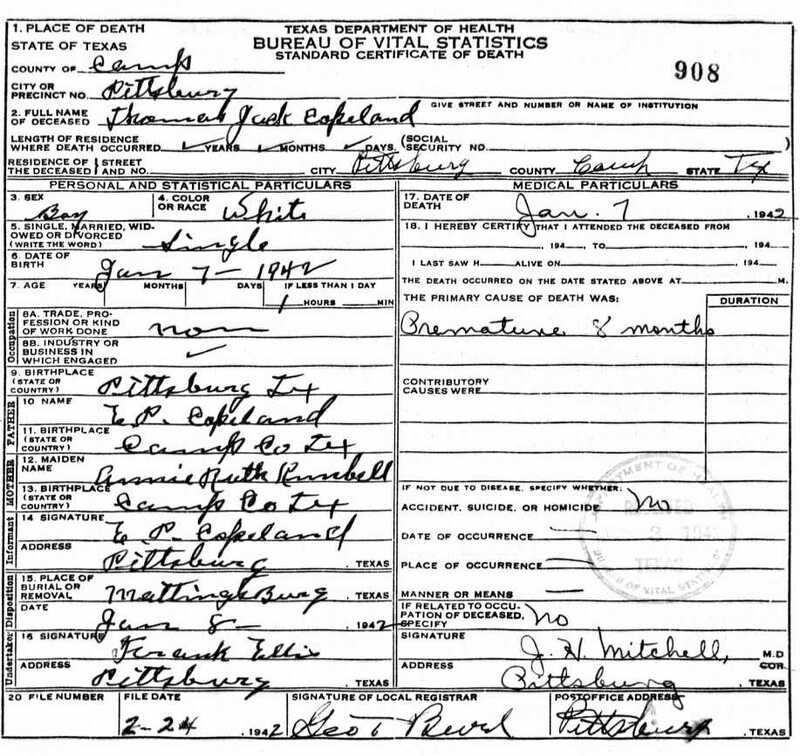 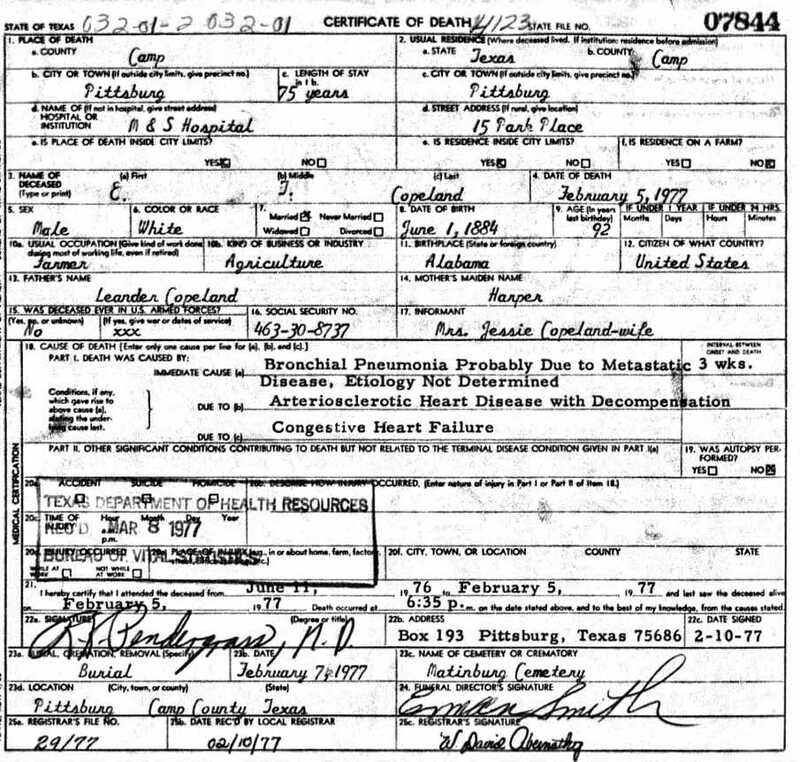 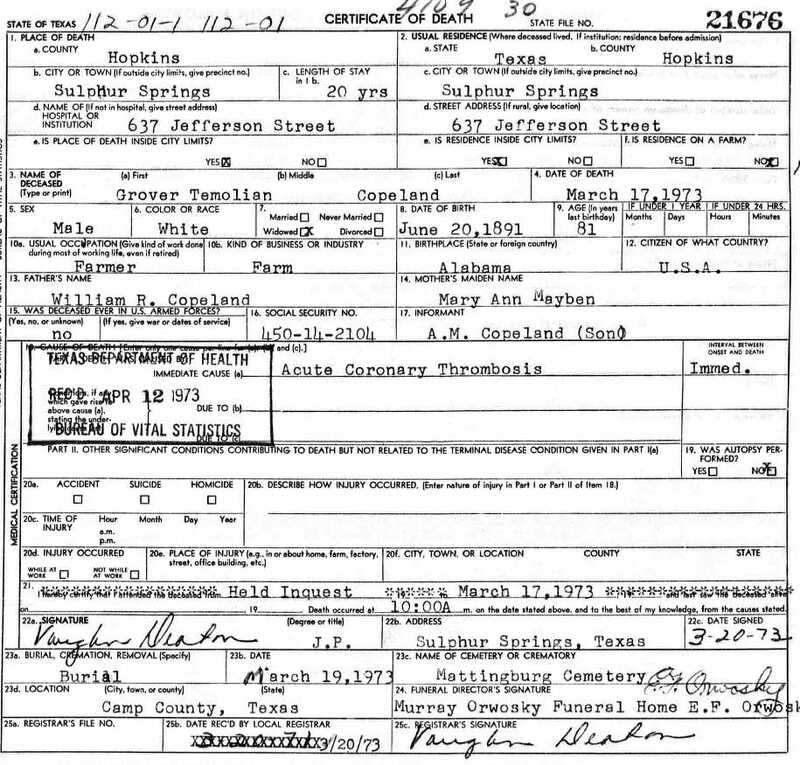 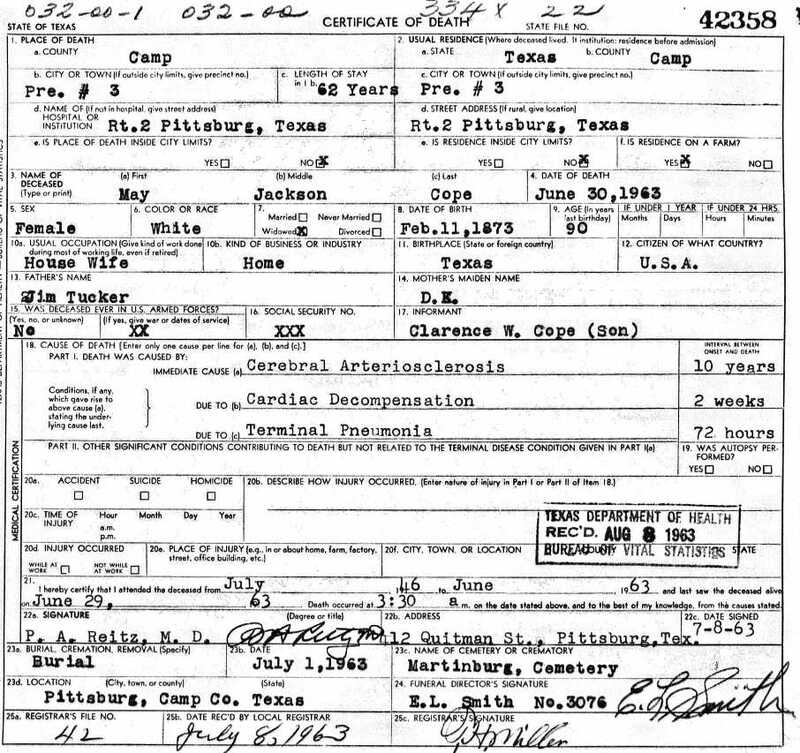 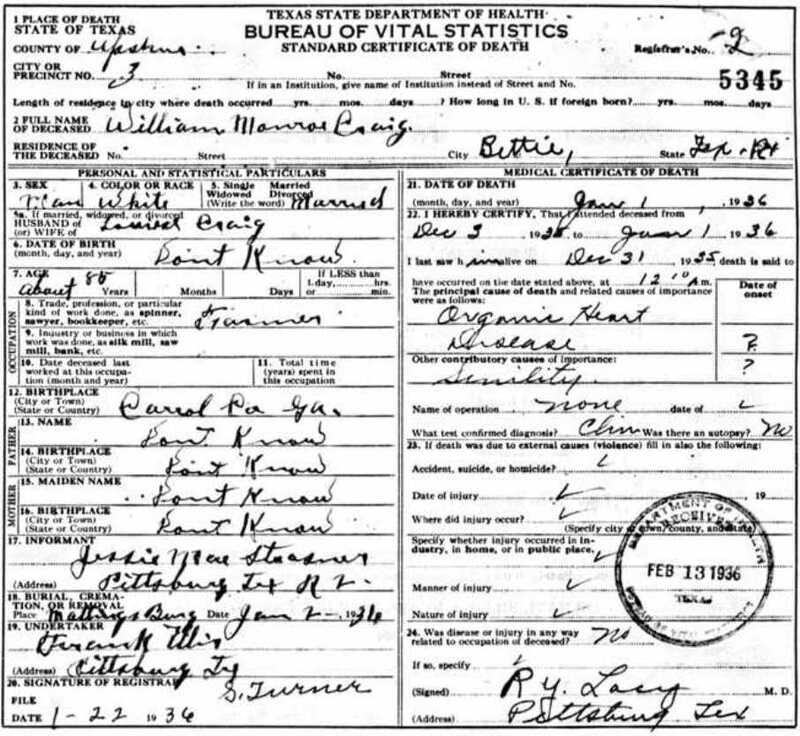 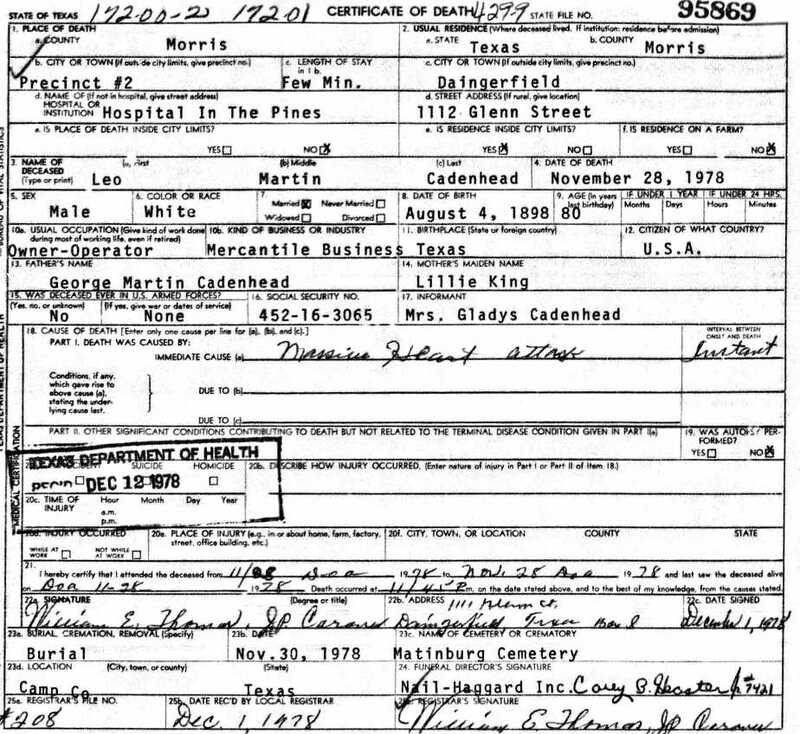 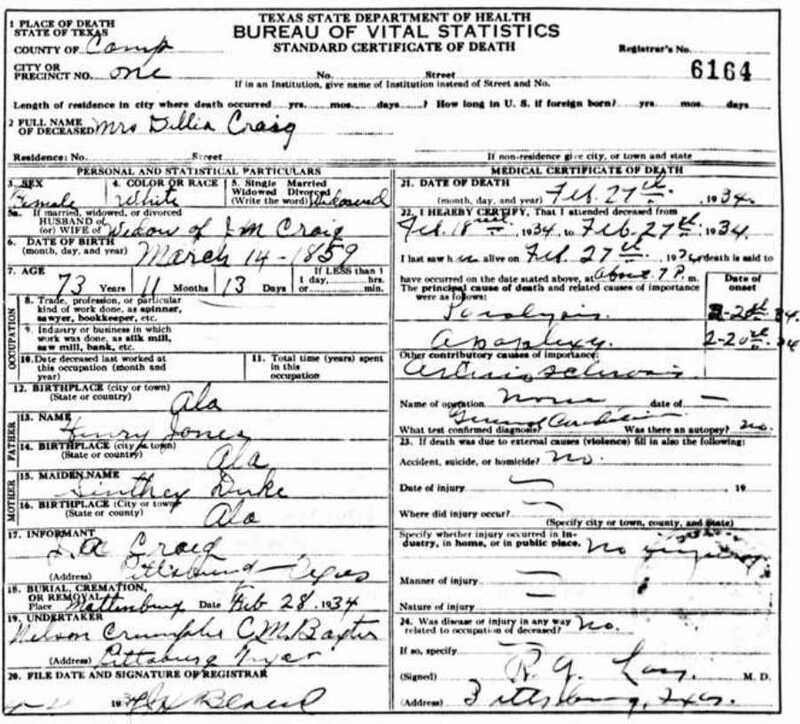 Copeland, Grover T Jun 20, 1889 Mar 17, 1973 Death Certificate; Per Ronald Wade - Grover Tamlian Copeland, born in Cherokee Co., Ala., the son of William Robert Copeland (1854 ? 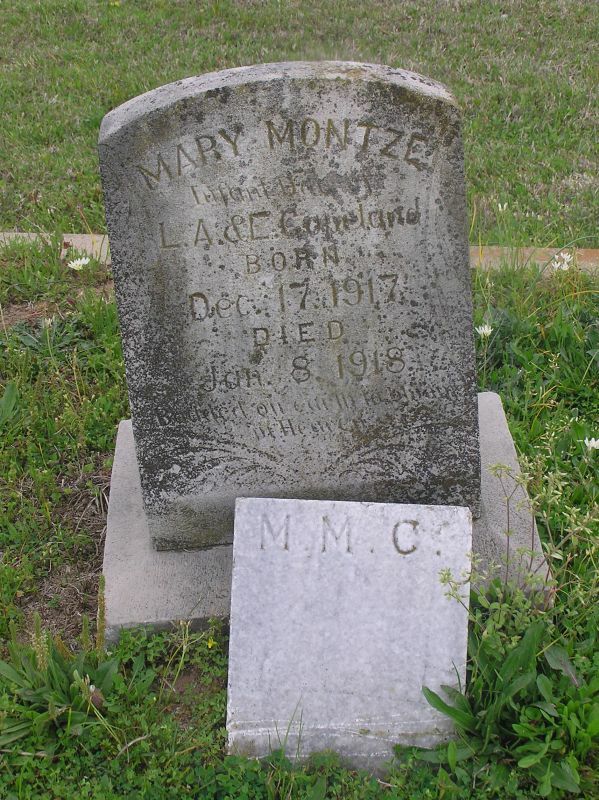 1908) & Mary Ann Mayben (1860 ? 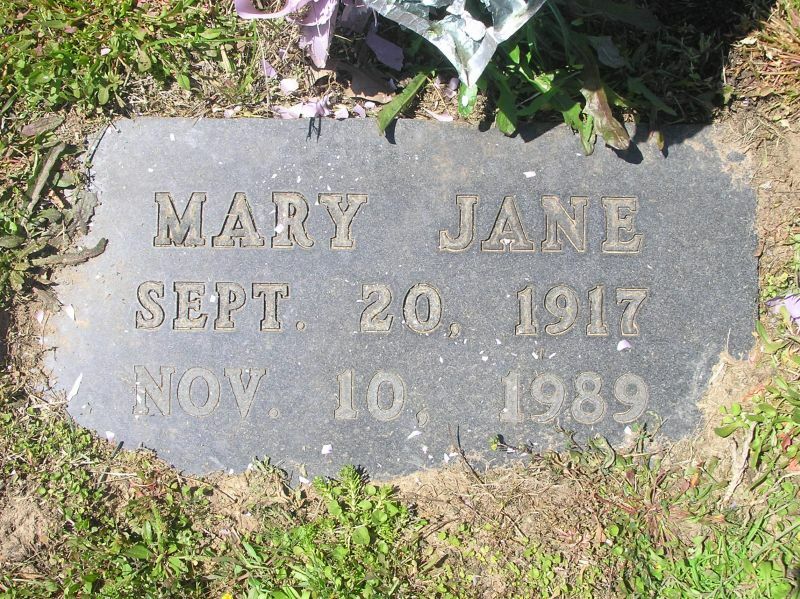 1918). 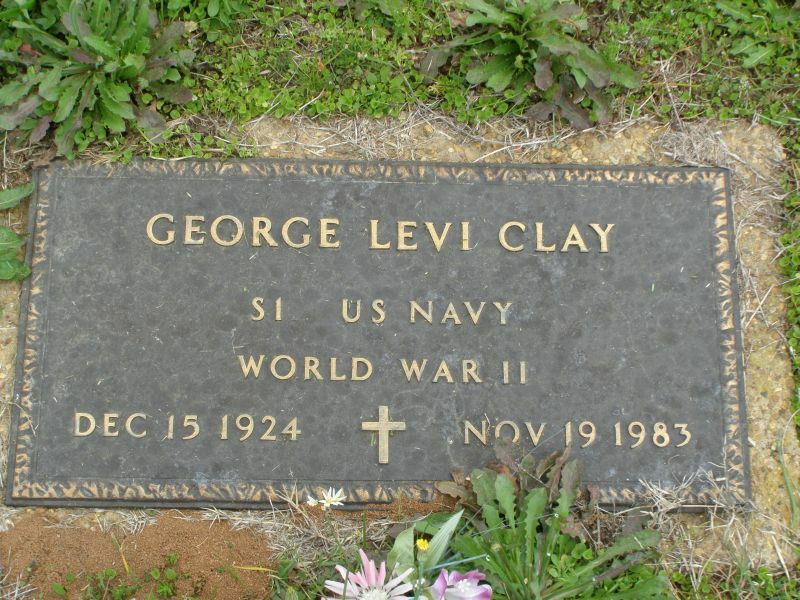 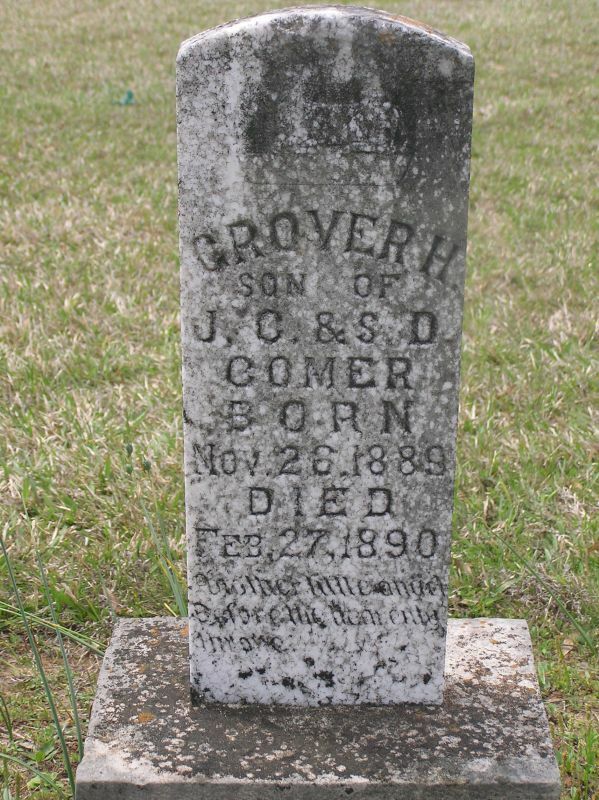 Grover was the nephew of Leander Copeland. 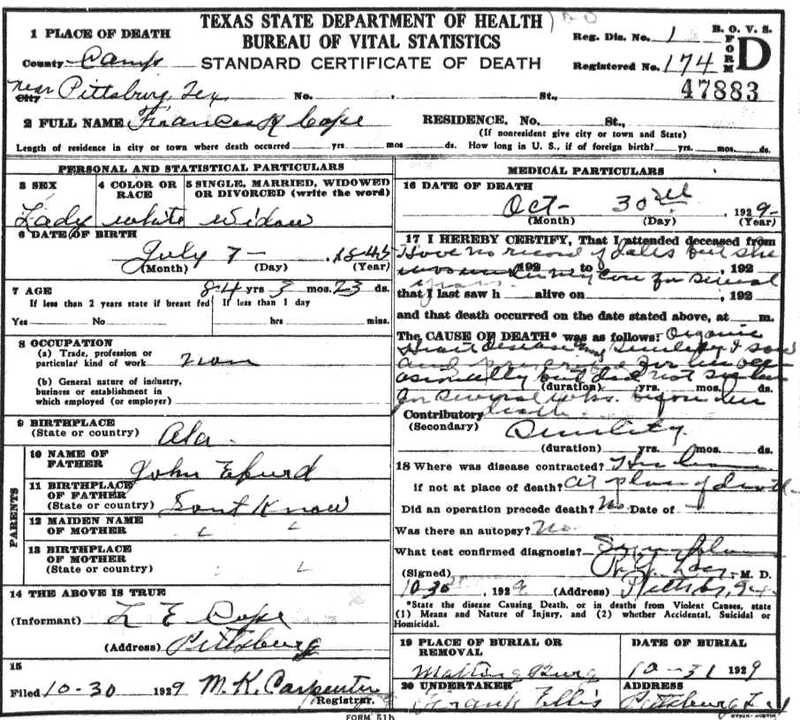 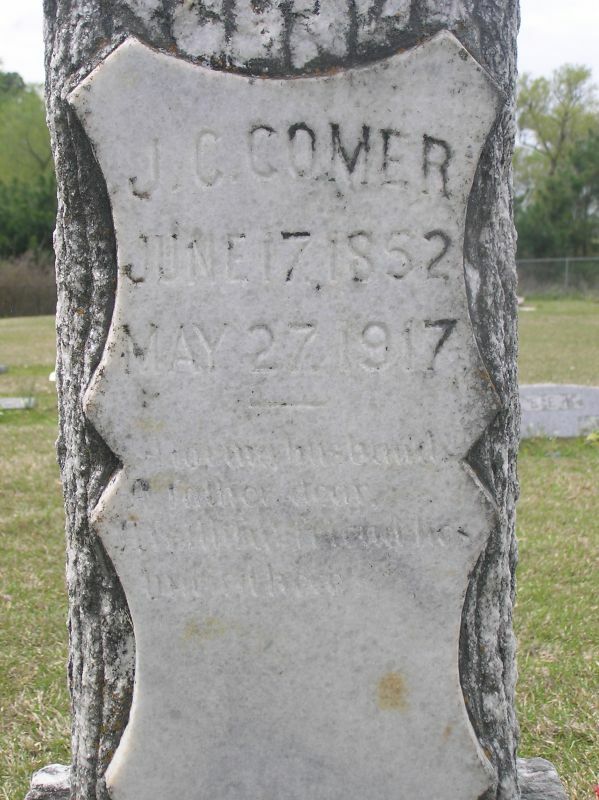 Grover died in Sulphur Springs, Hopkins Co., Texas. 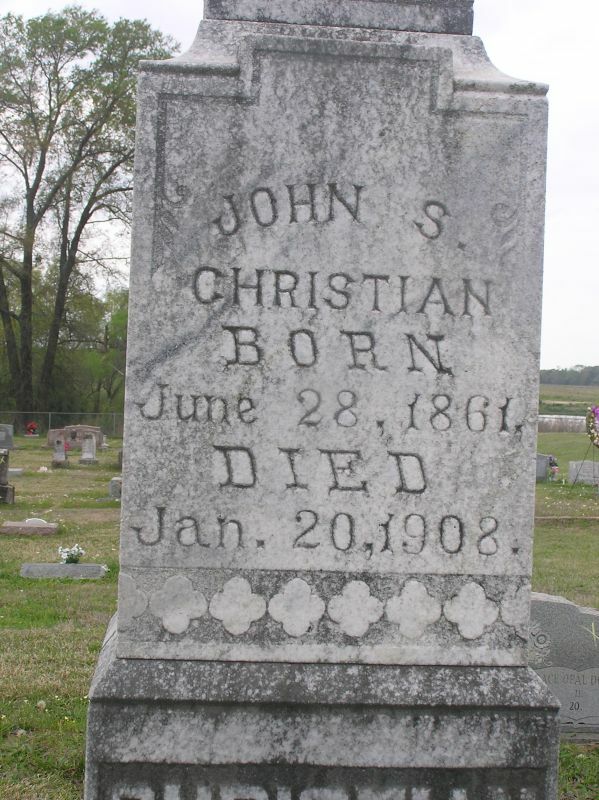 He married Bernice Goolsby (1899 ? 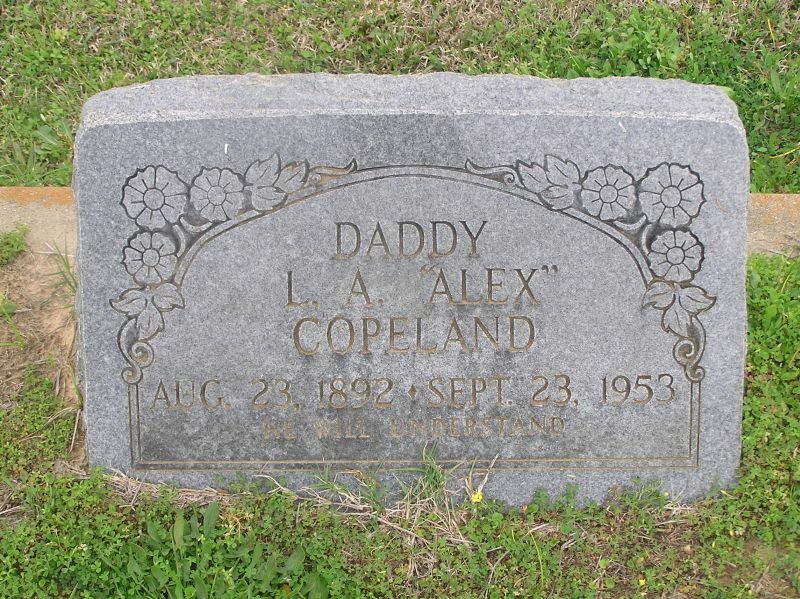 1952) and their children included Thelma Copeland born about 1914, Lester Copeland (1915-1915), Aaron M. Copeland (17 Aug 1916 - 1 Dec 1987 buried Restland Memorial Cemetery, Dallas, Tx. 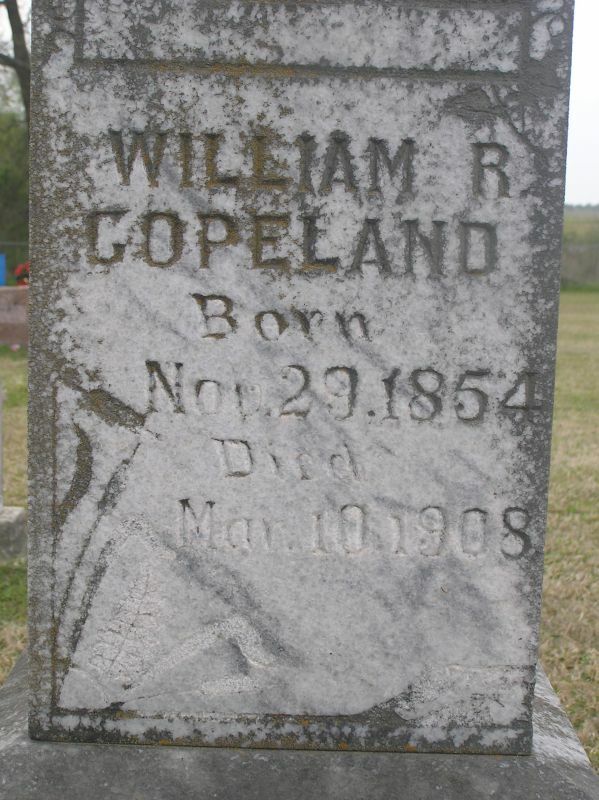 ), Grover T. Copeland, Jr. (30 Jan 1923 - 22 Feb 1997, buried Perryville Cemetery, Wood Co., Tx. 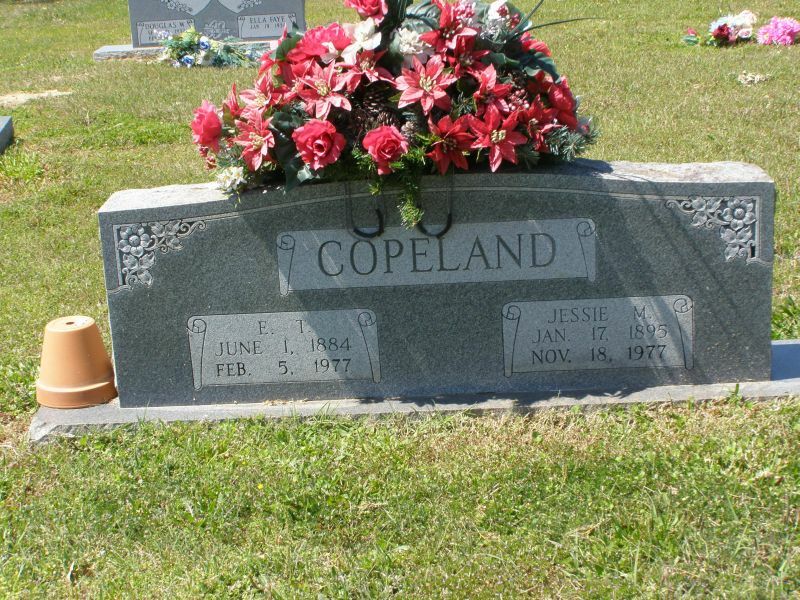 ), Owis K. Copeland (19 Sep 1924 - 4 Nov 2000 Rockwall Co., Tx.) 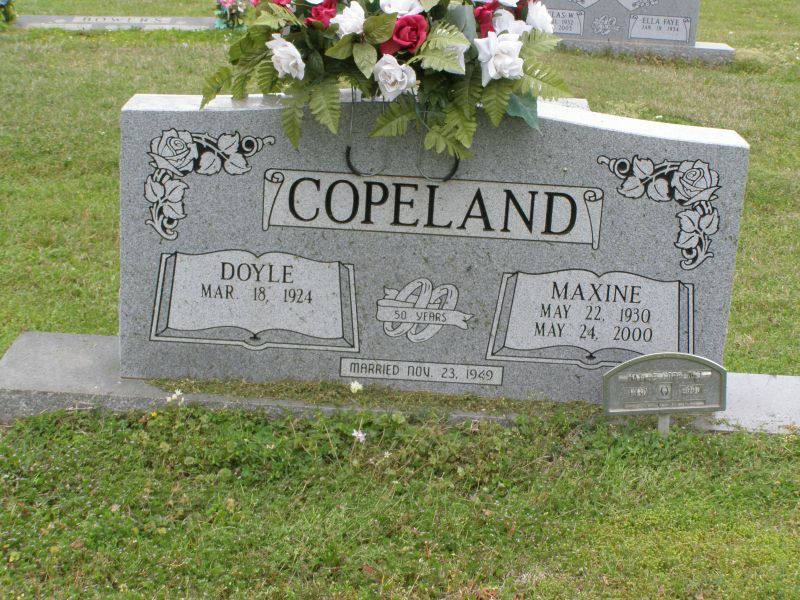 and Mary Avie Copeland (born 29 Feb 1928). 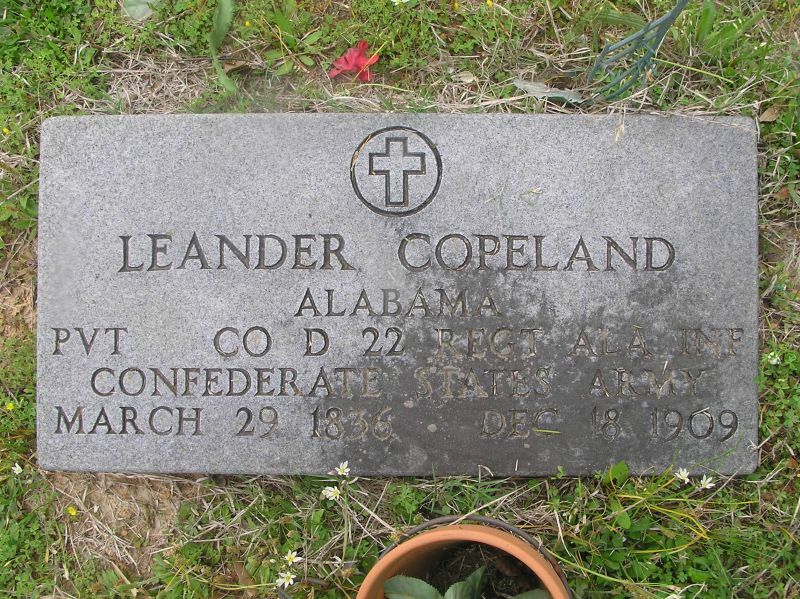 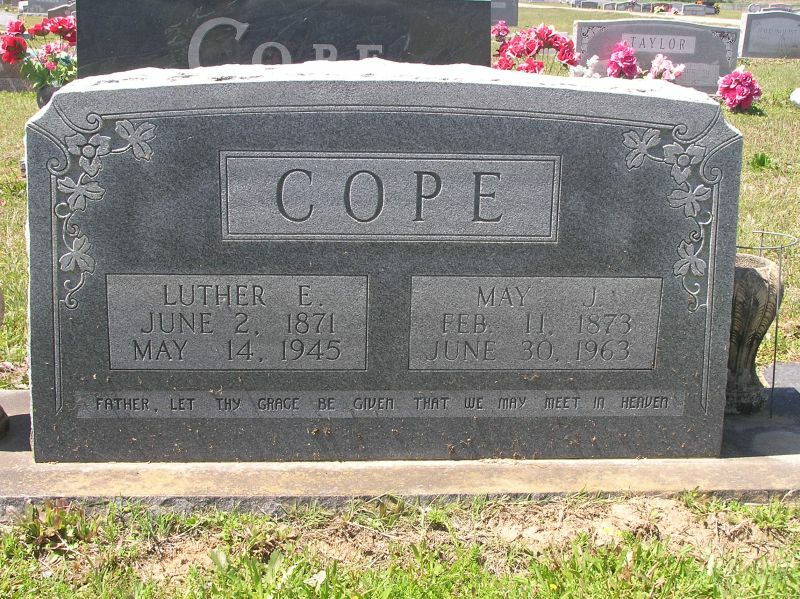 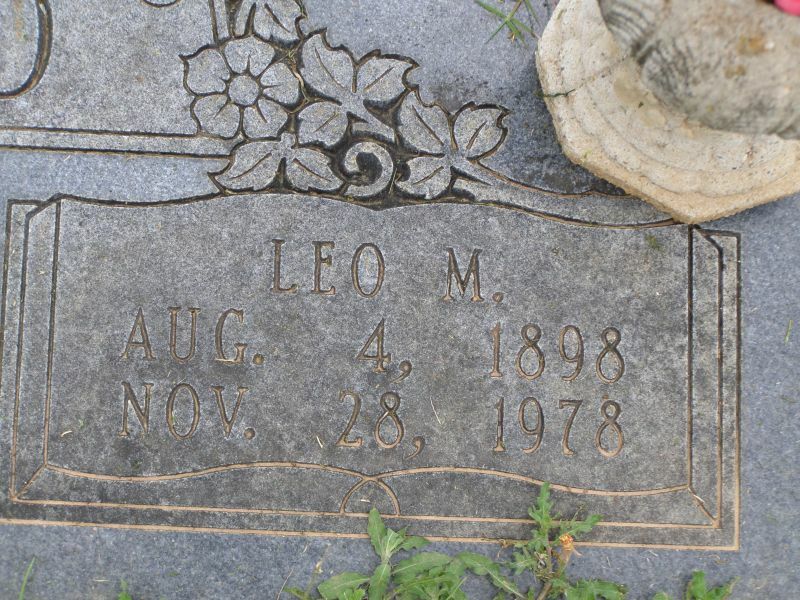 Copeland, Leander Mar 29, 1836 Dec 18, 1909 Per Ronald Wade - Leander Copeland, born in Dist. 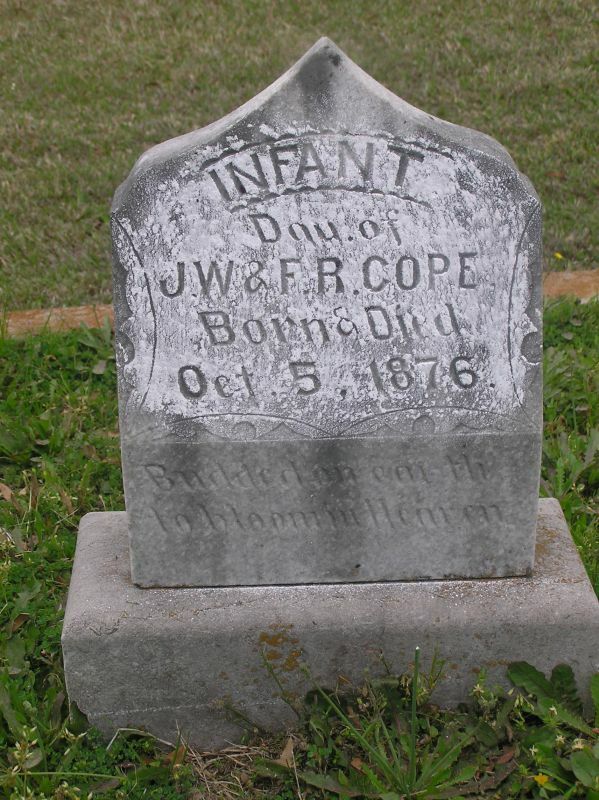 of York, SC, was the son of William Camp Copeland (1809 – 1894) & Diannah Hopper (1809 – 1880). 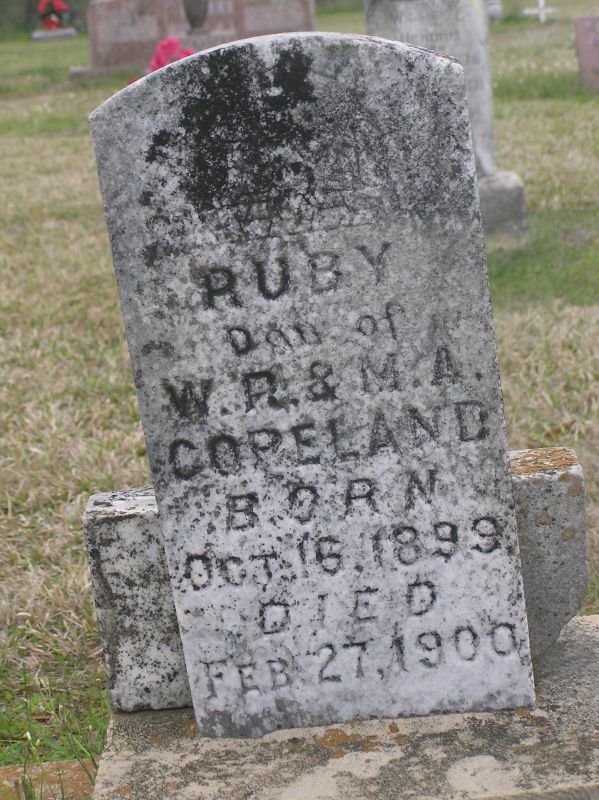 On 2 Apr 1857 in Cleveland, N.C. he married Kisiah Ann Putman (1839 – 1870) and their children included Philo Clingman Copeland (1859 – 1941), Manley Jackson Copeland (1859 – 1908), Zenora Hester Copeland (1861 – 1913), Pauline Verasty Copeland born about 1862, William Willis Copeland born about 1865, Jeroam Phesilonies Copeland born about 1867, Lorena Sophia Copeland (1868 – 1935) and Forest Mathis Copeland (1870 – 1948). 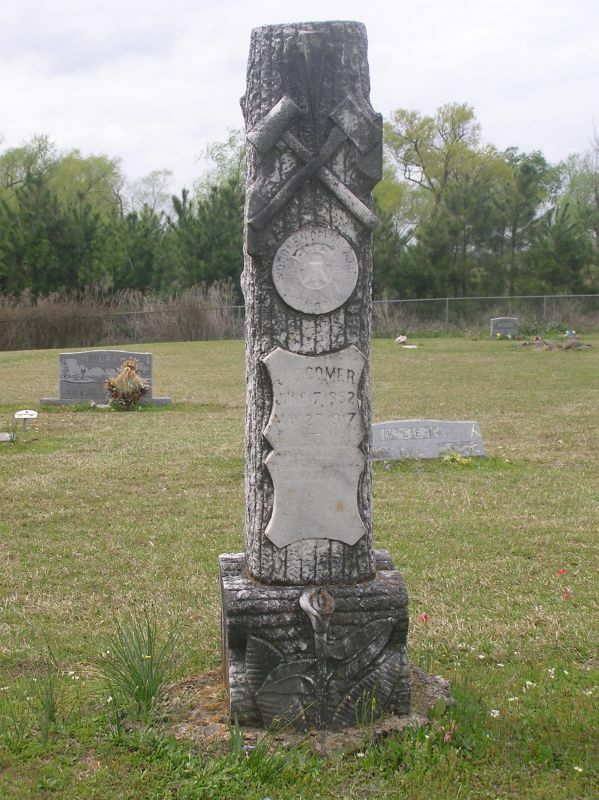 In 1871 in Cherokee, Alabama he married Nancy Catherine Wilson (1843 – 1880). 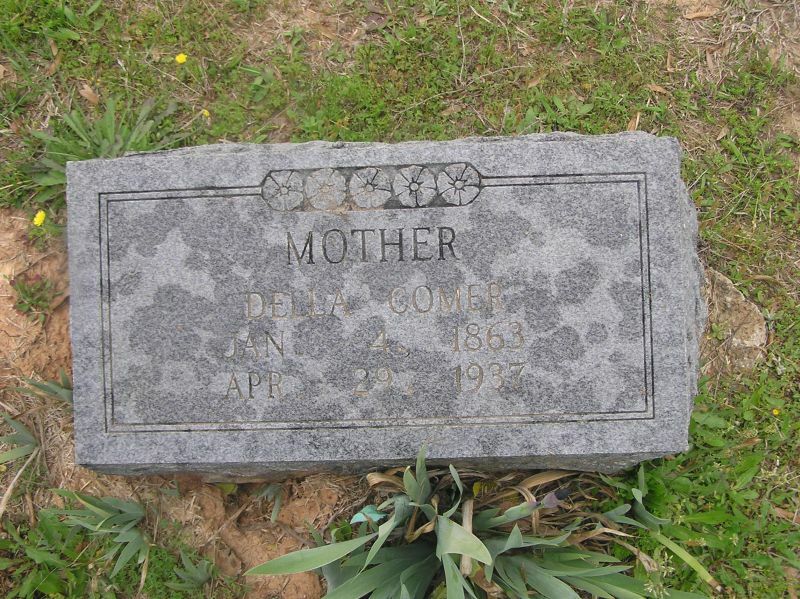 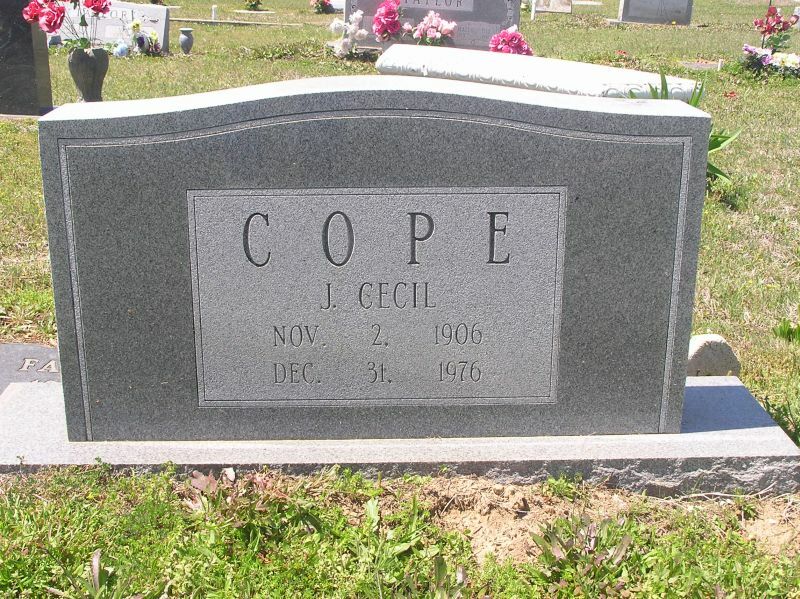 They had children that included Loriner S. Copeland born about 1868, Marion A. Copeland born about 1872, Leonardis O. Copeland (1873 – 1943), Viola L. Copeland born about 1878, and Ellen Irene "Jip" Copeland (1879 – 1933). 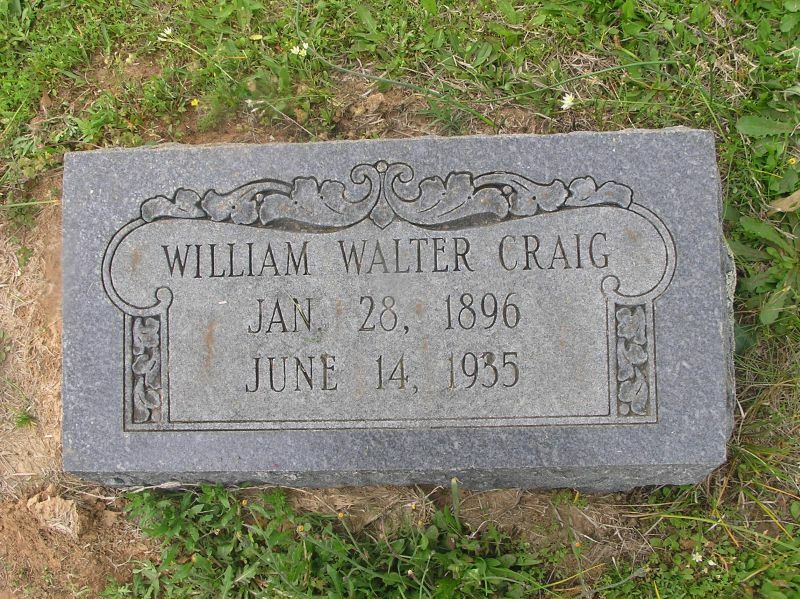 Following his second wife's death he married on 14 Dec 1880 in Cleveland, NC to Flora Hopper McDowell (1852-1919). 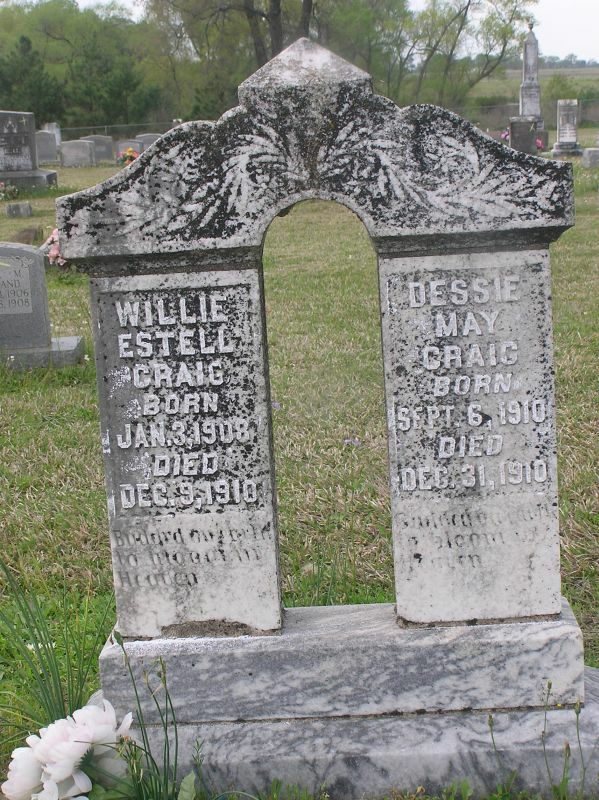 Their children included Lawton A. Copeland (1881 – 1901), Bertha Elizabeth Copeland (1883 – 1912), E.T. 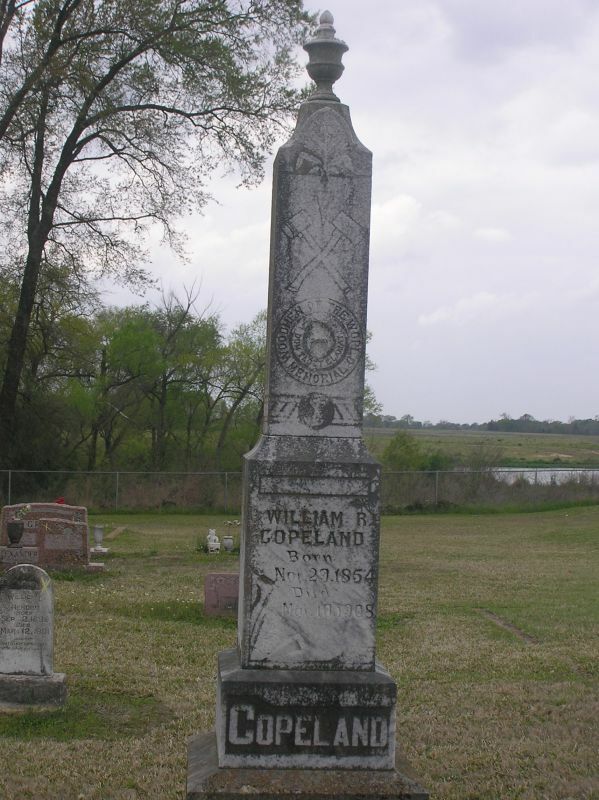 Winkler Copeland (1884 – 1977), Pendleton Graves Copeland (1887 – 1931) and Rollins Edgar Copeland (1895 – 1915). 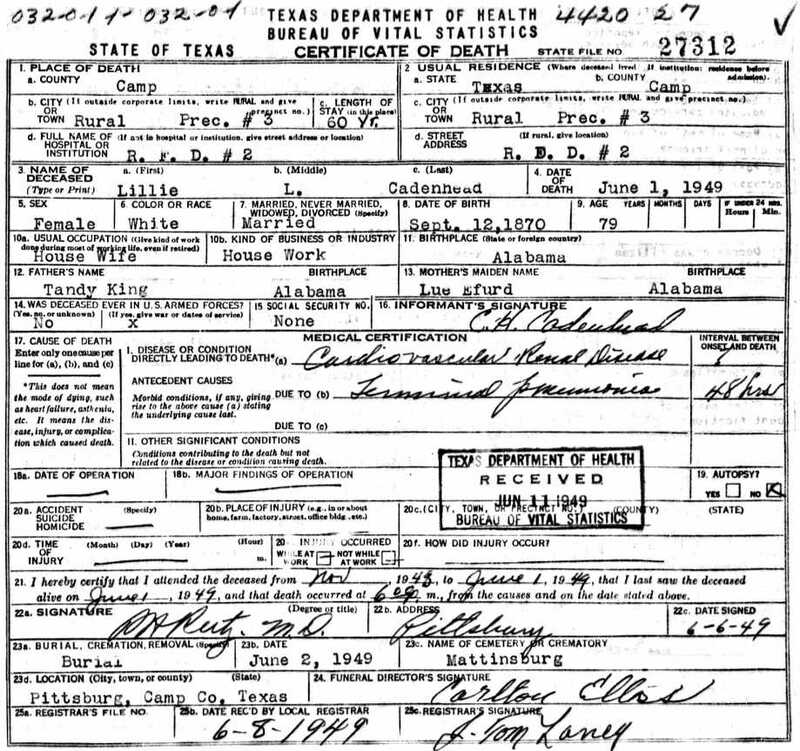 From NC the family moved to Brindley, Cherokee Co., Alabama but had moved to Camp County, Texas by the 1910 federal census. 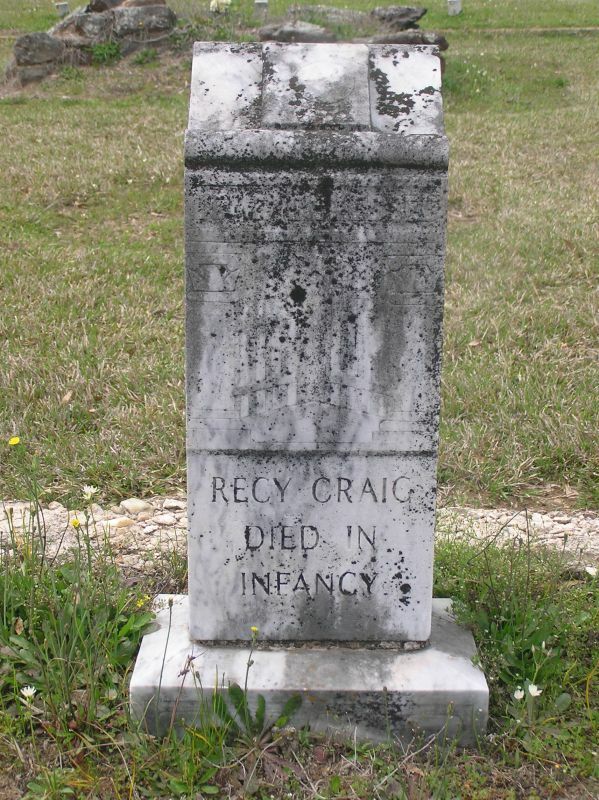 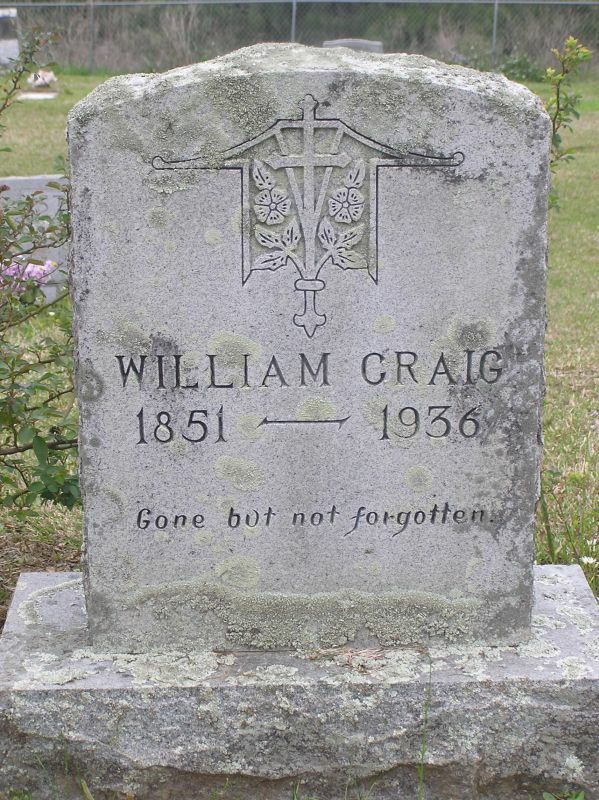 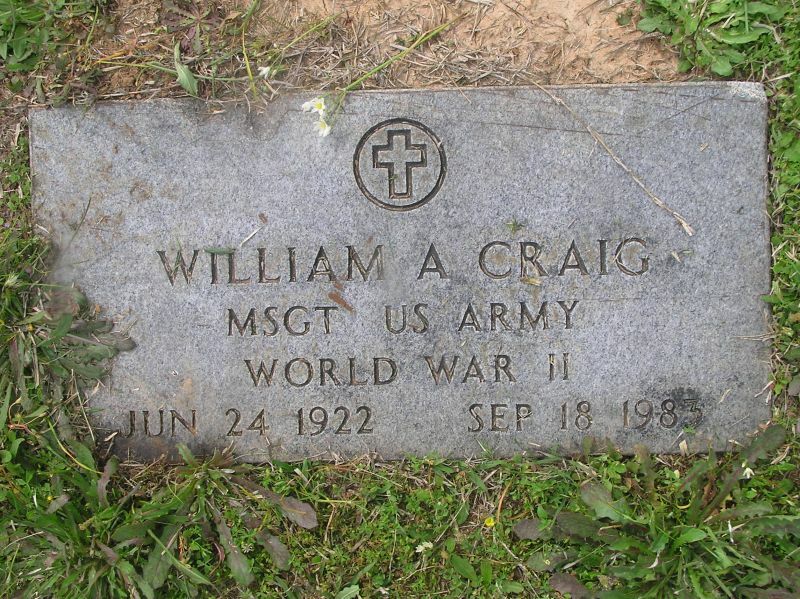 During the Civil War he enlisted as a Pvt, Co. D, 22nd Rgt Al Inf, CSA. 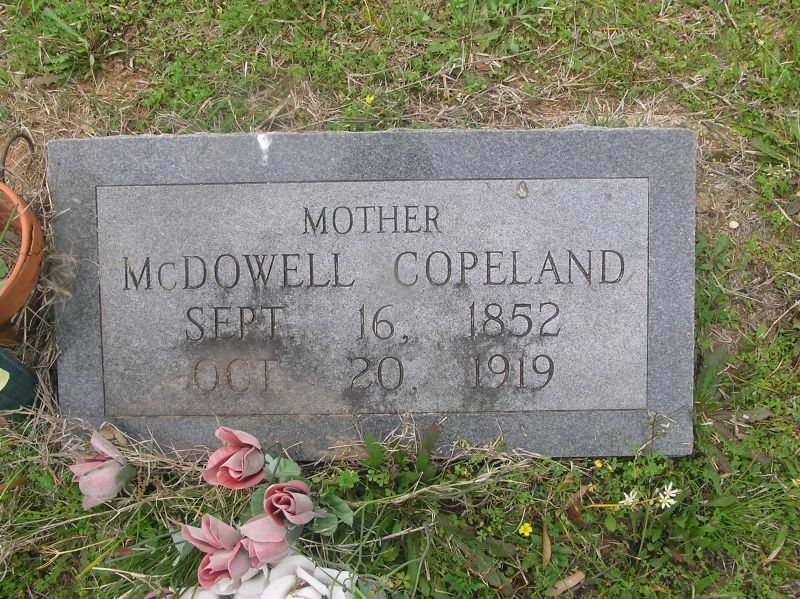 Copeland, McDowell Sep 16, 1852 Oct 20, 1919 Per Ronald Wade - Flora Hopper McDowell Copeland, born Rock Hill, York, SC, the daughter of Joab Hopper (1810 – 1880) & Minerva Elizabeth McDowell (1827 – 1880). 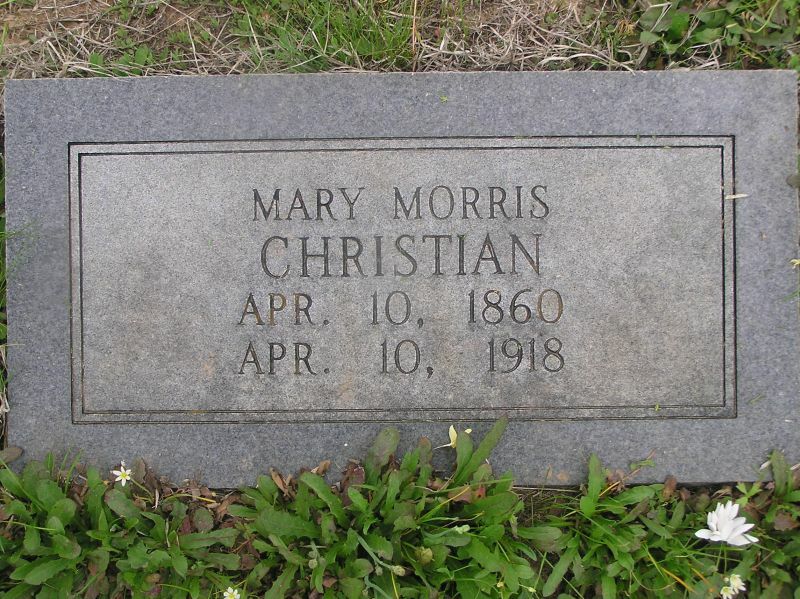 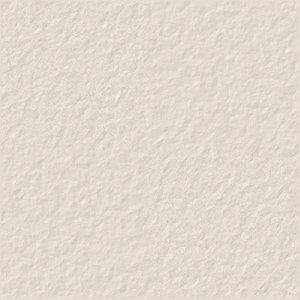 After 1872 and before 1880 she had married Simeon Putman who had died by the 1880 Federal Census and left a daughter by a previous marriage who was born 1872. 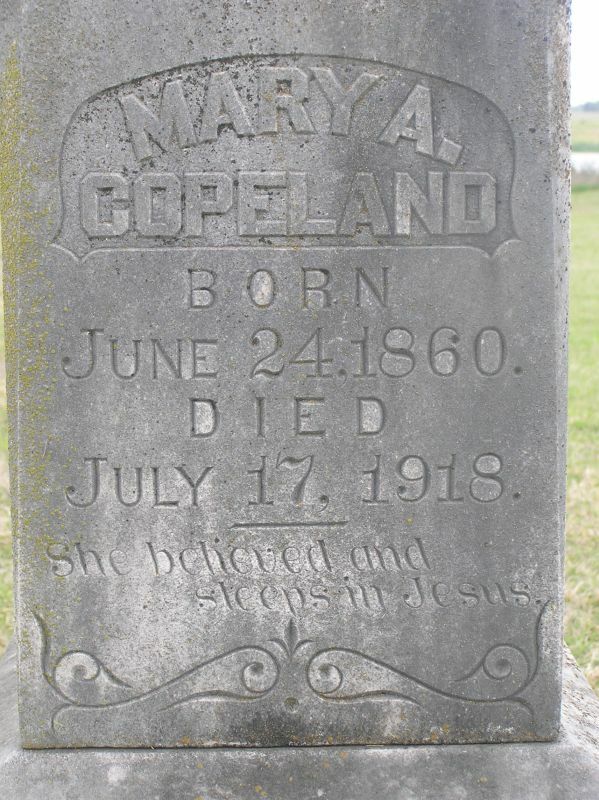 On 14 Dec 1880 in Cleveland, NC she married Leander Copeland (1836 – 1909). 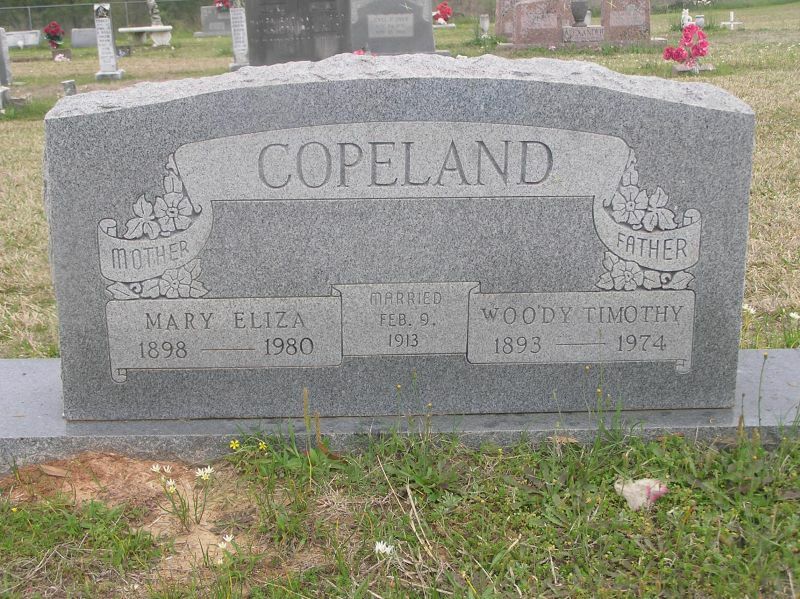 Their children included Lawton A. Copeland (1881 – 1901), Bertha Elizabeth Copeland (1883 – 1912), E.T. 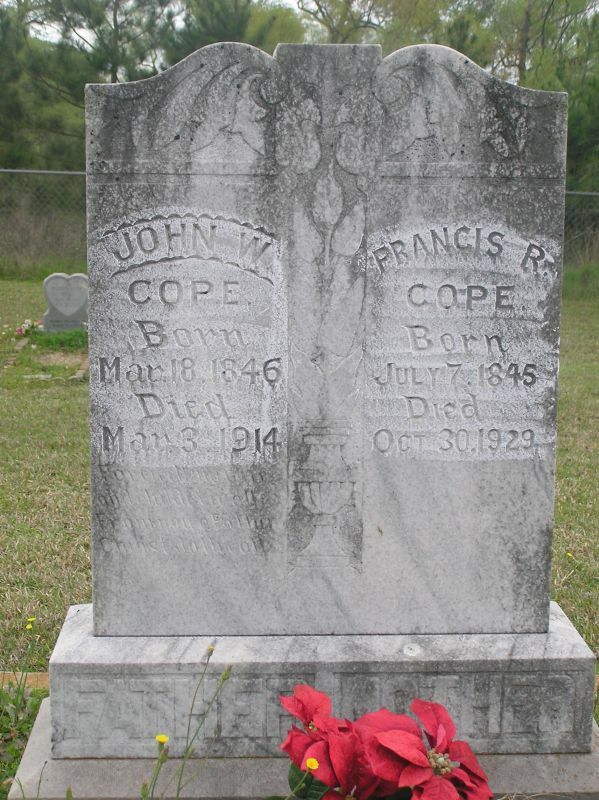 Winkler Copeland (1884 – 1977), Pendleton Graves Copeland (1887 – 1931) and Rollins Edgar Copeland (1895 – 1915). 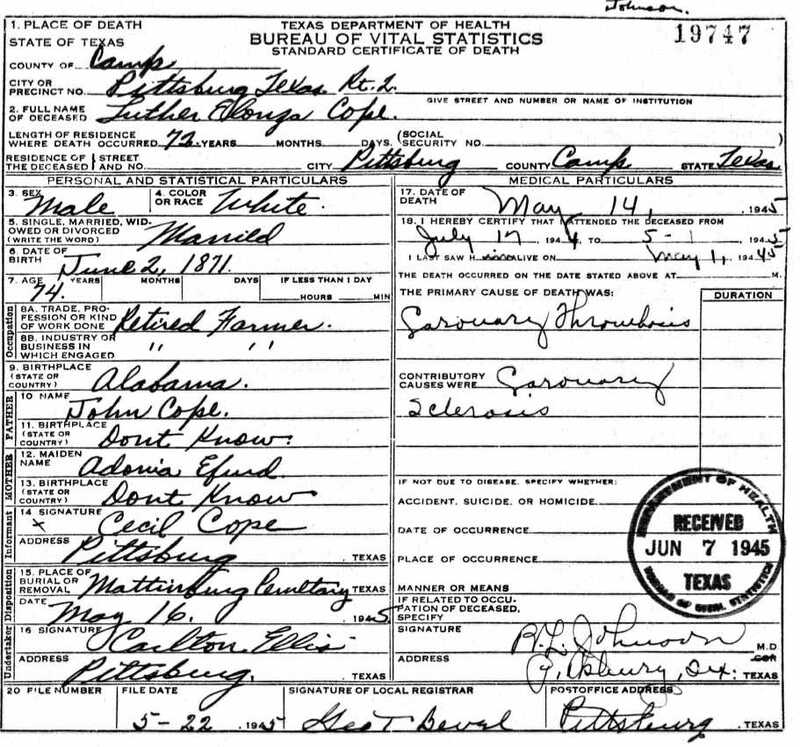 From NC the family moved to Brindley, Cherokee Co., Alabama but had moved to Camp County, Texas by the 1910 federal census.